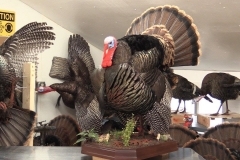 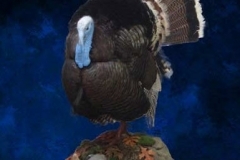 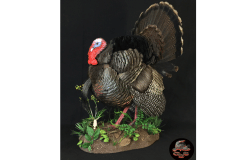 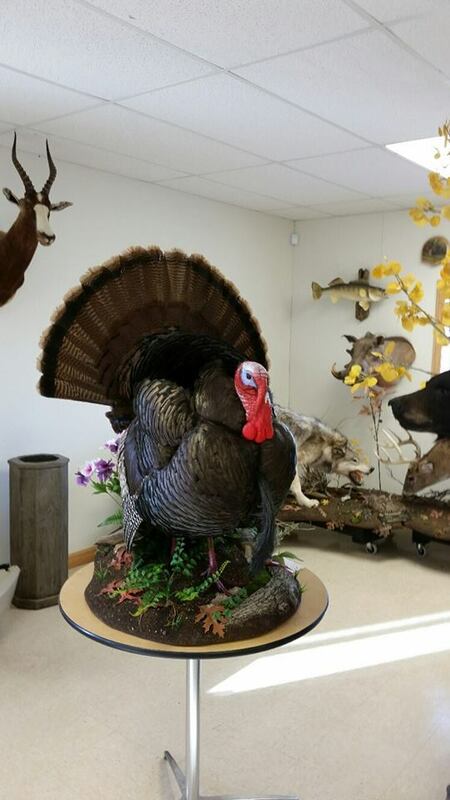 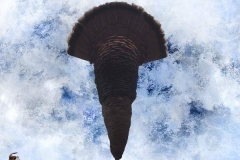 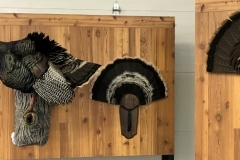 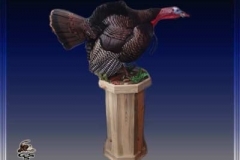 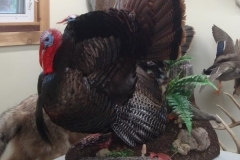 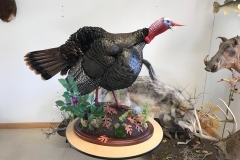 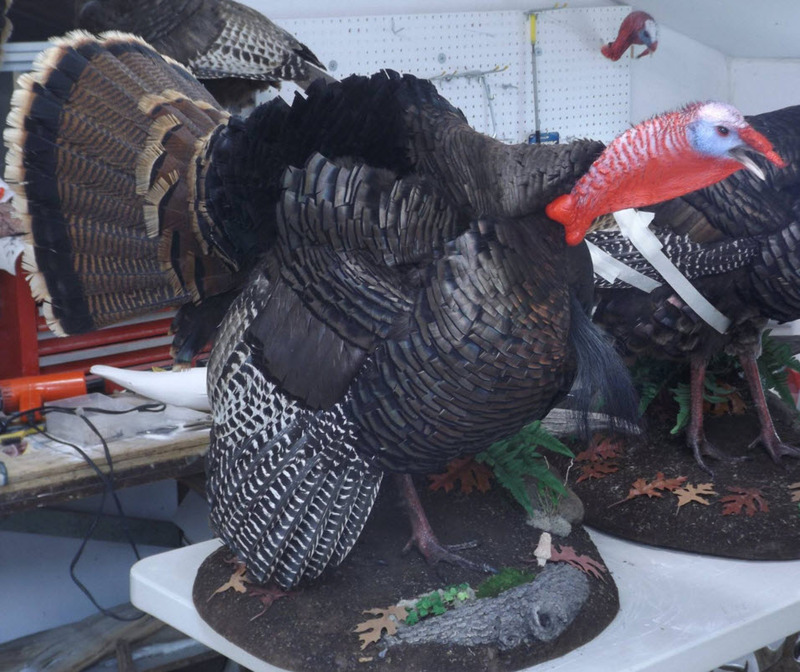 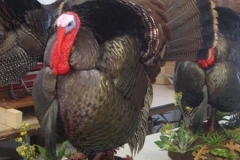 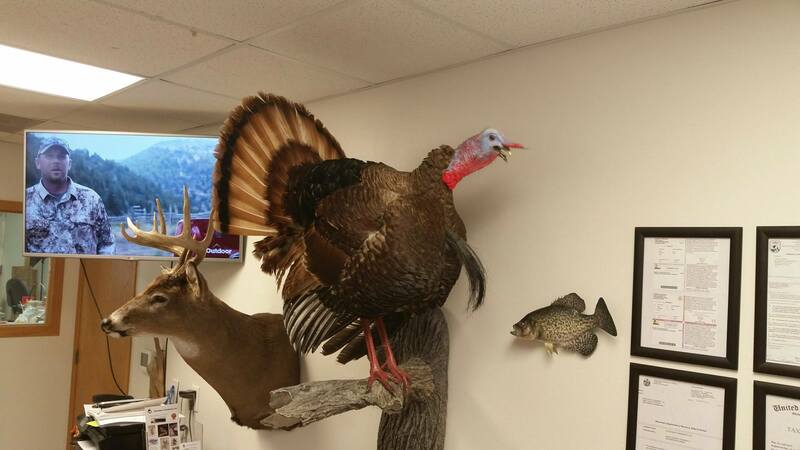 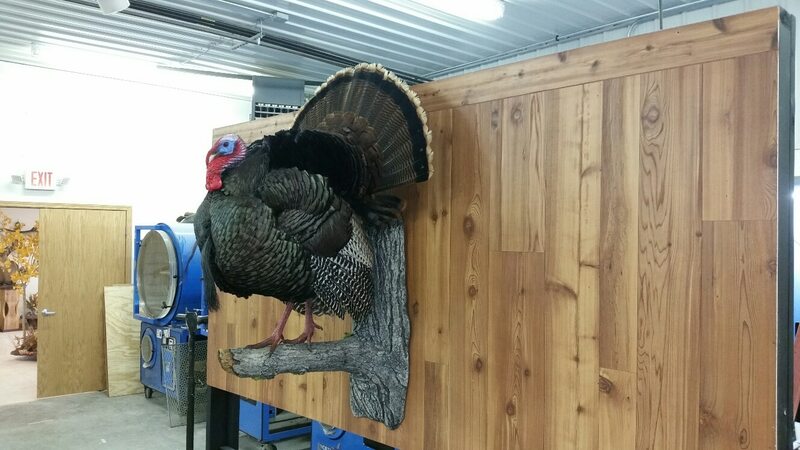 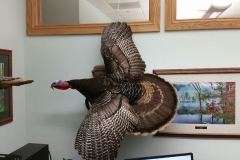 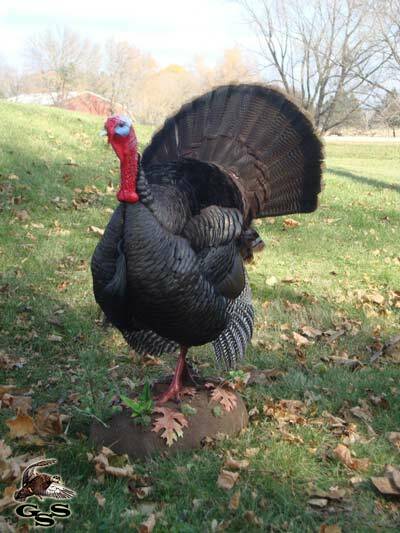 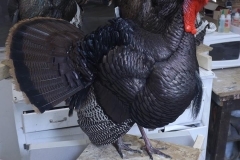 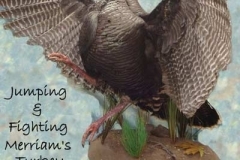 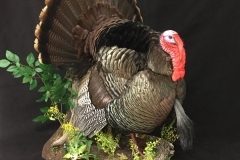 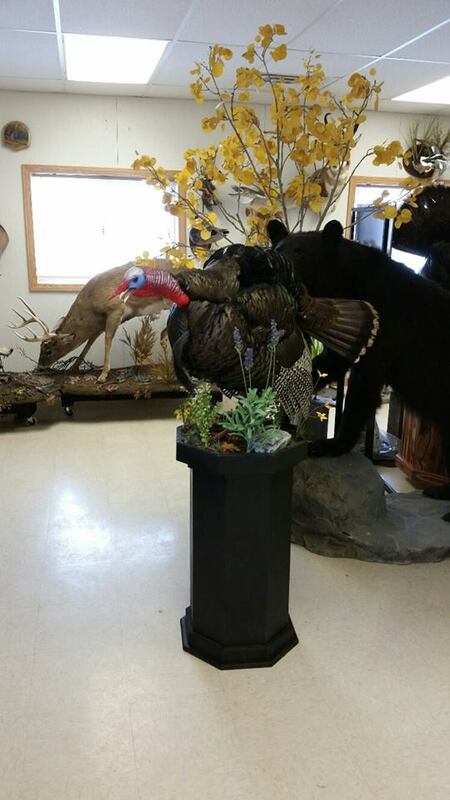 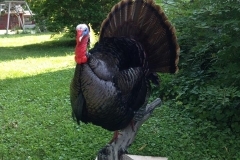 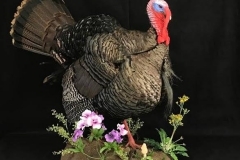 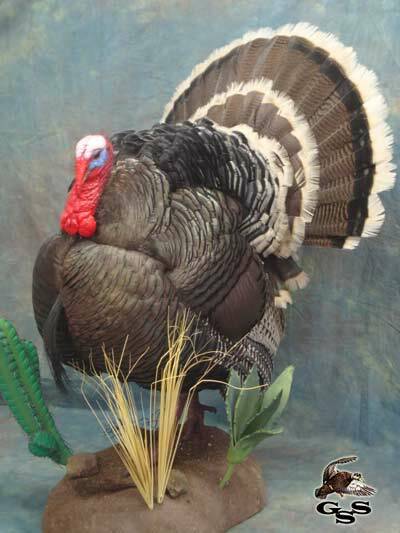 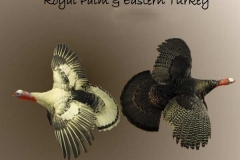 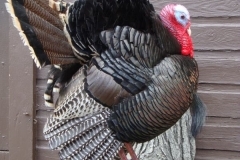 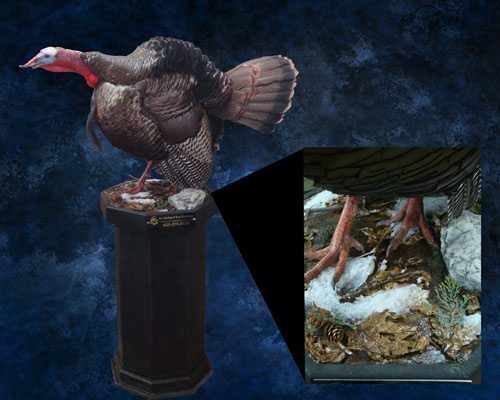 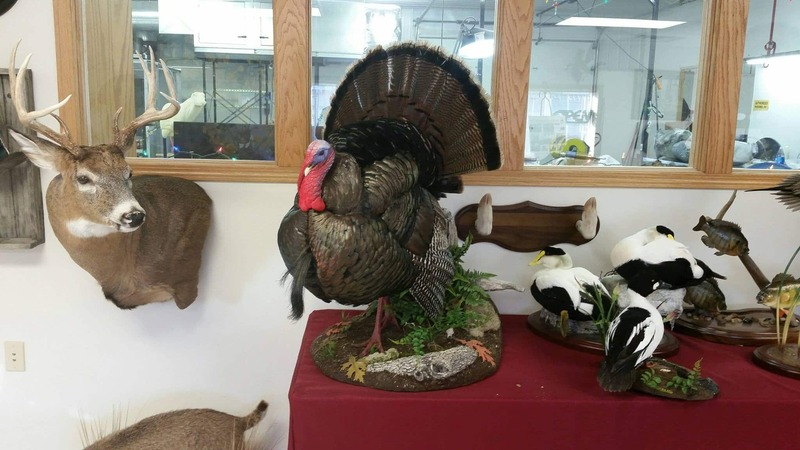 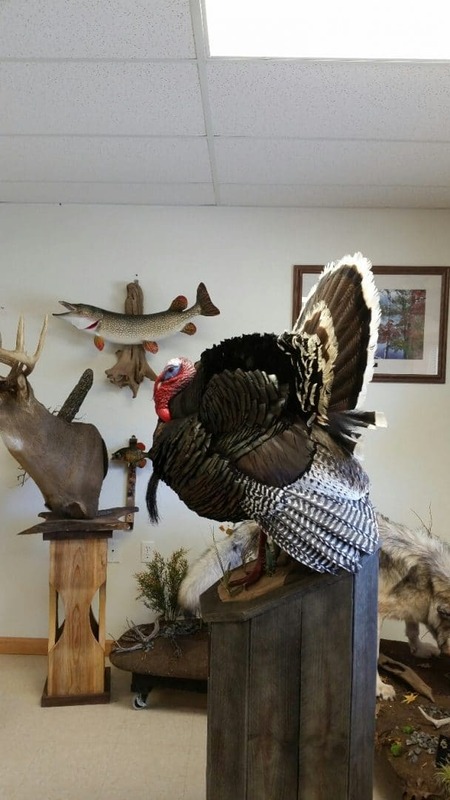 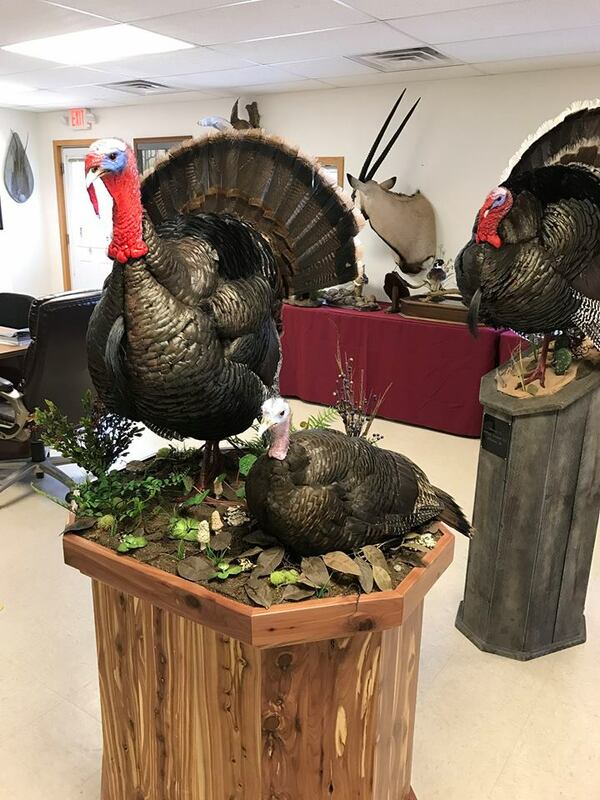 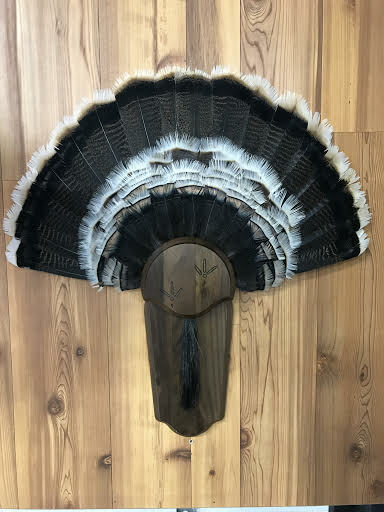 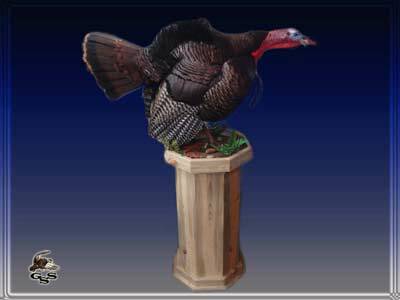 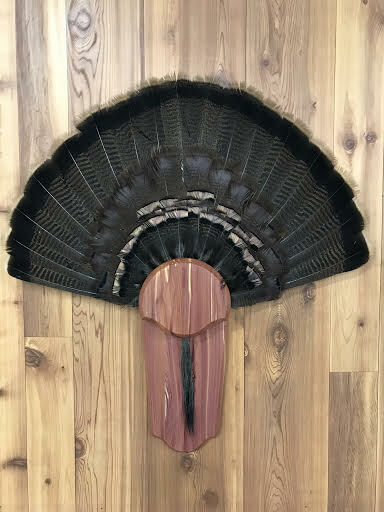 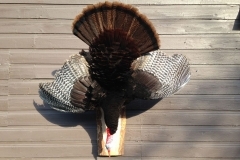 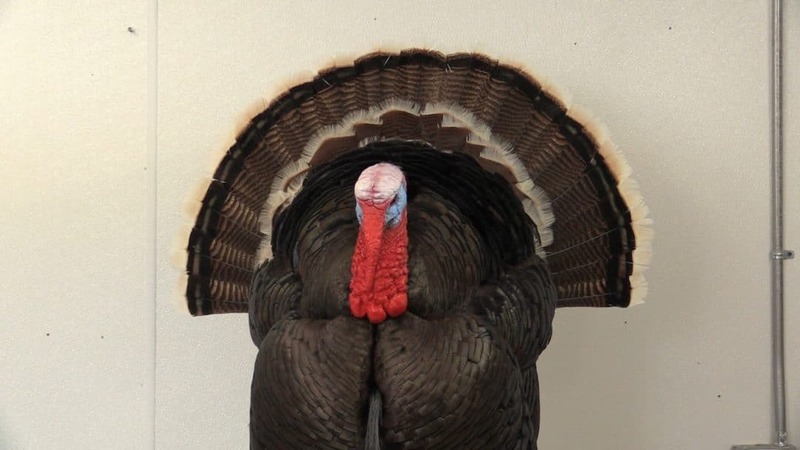 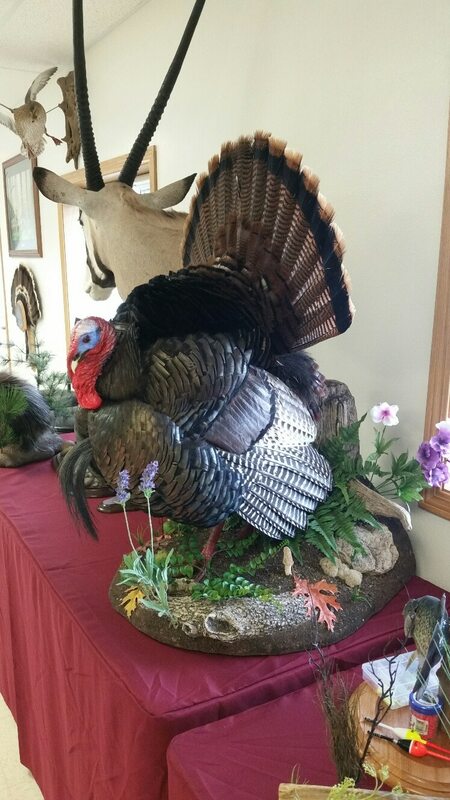 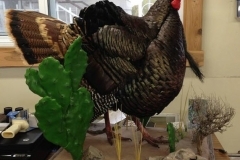 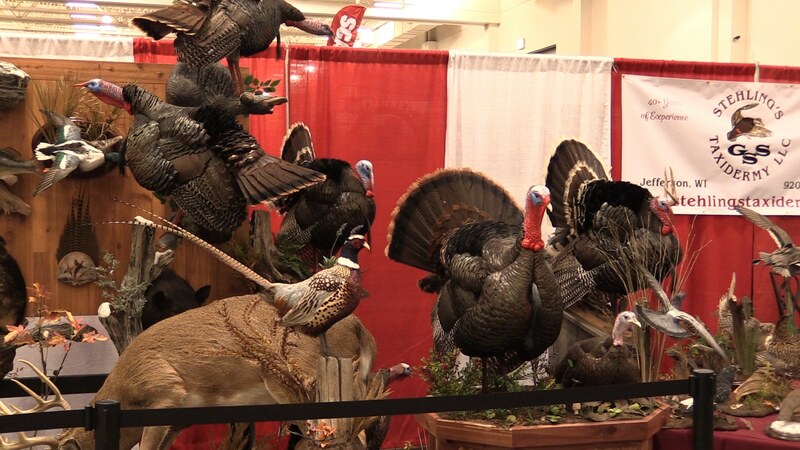 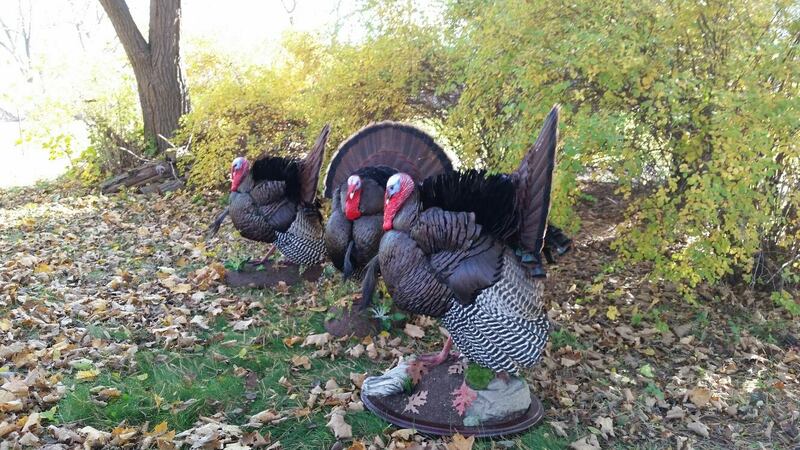 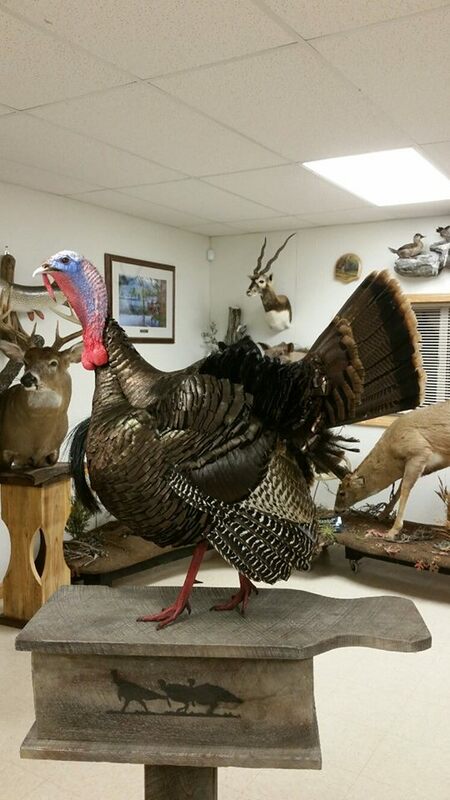 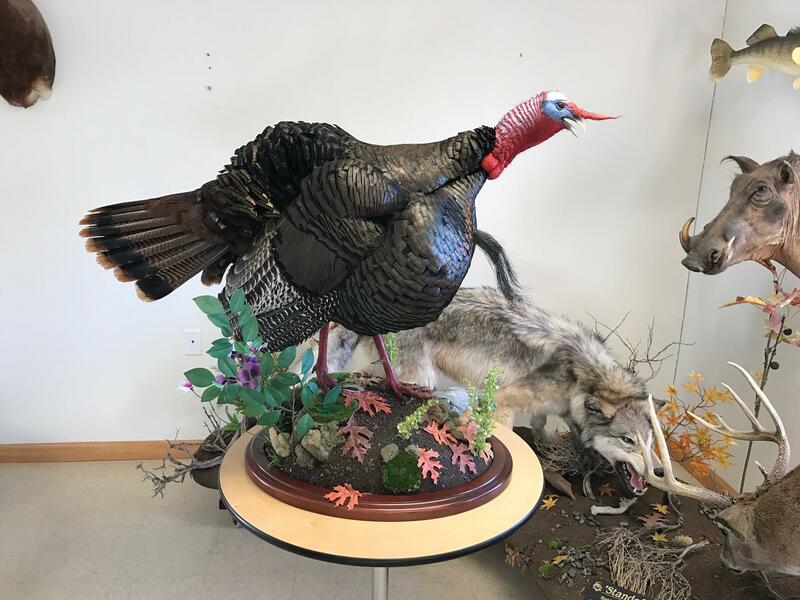 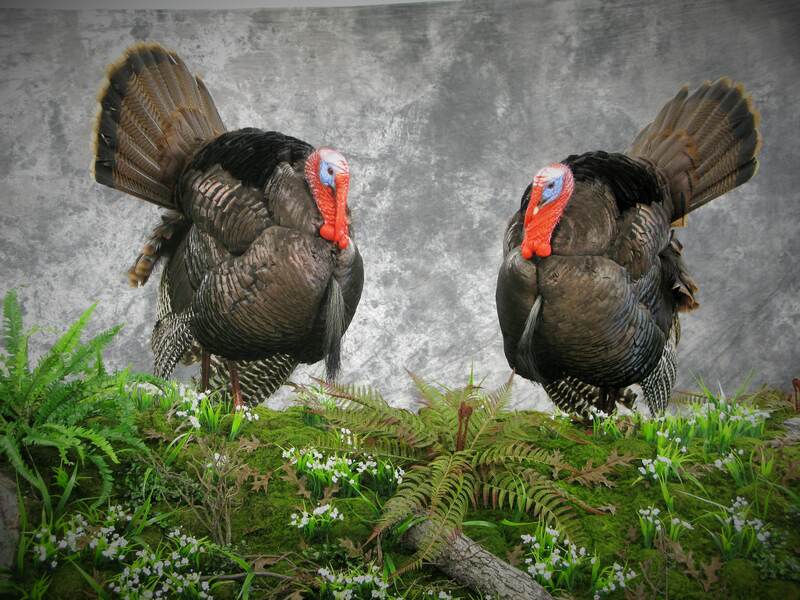 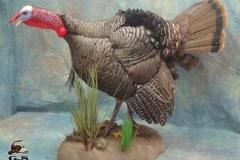 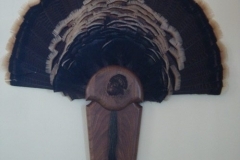 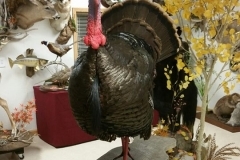 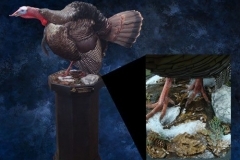 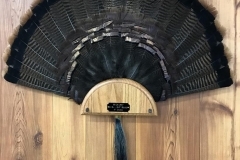 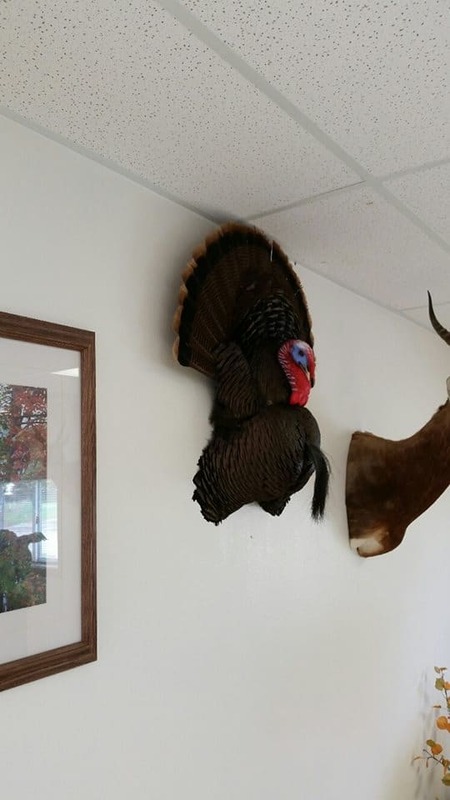 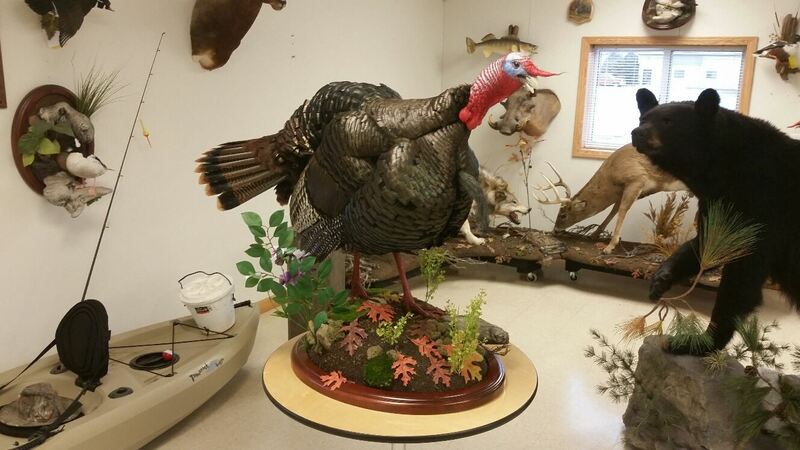 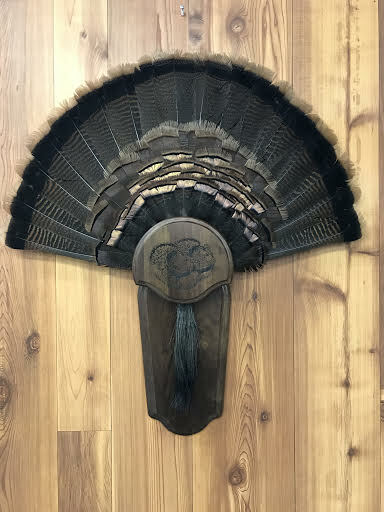 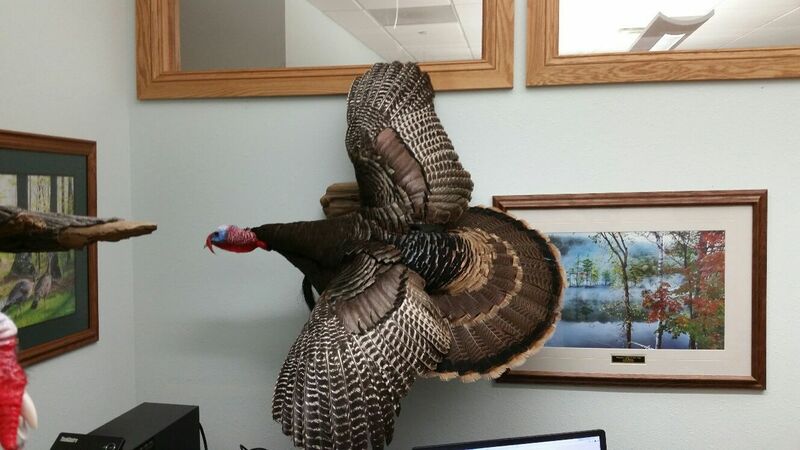 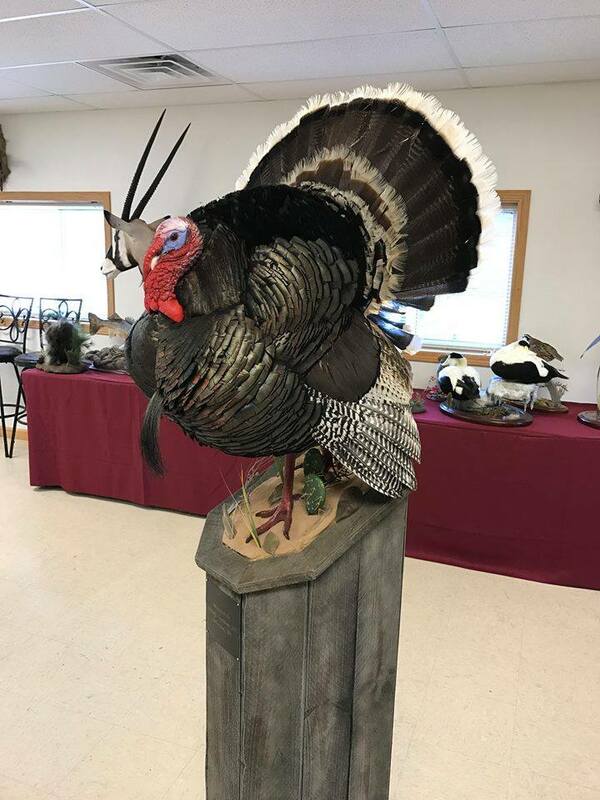 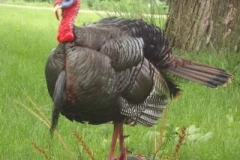 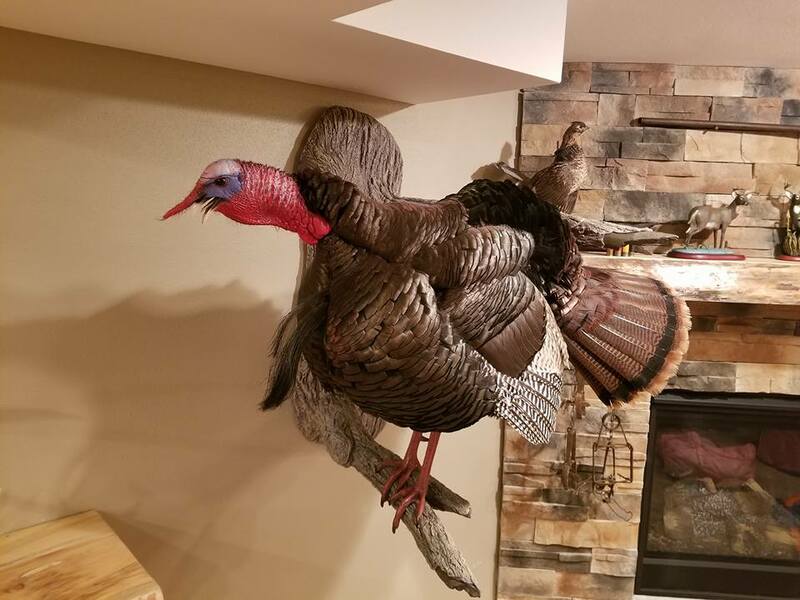 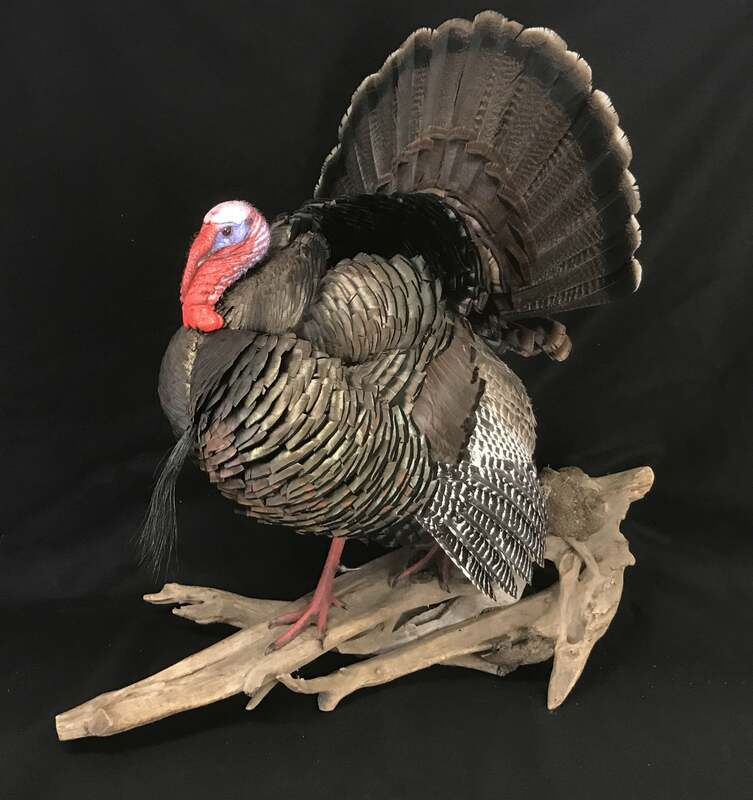 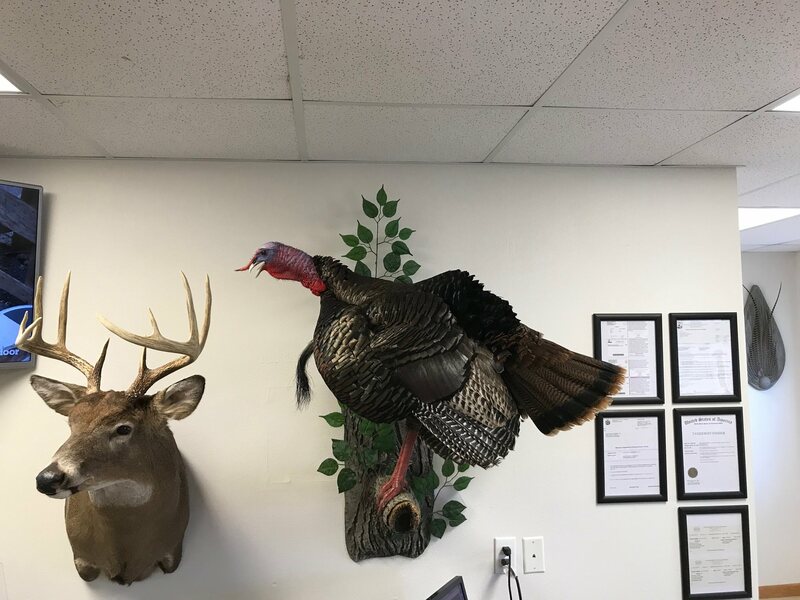 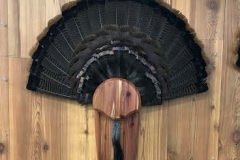 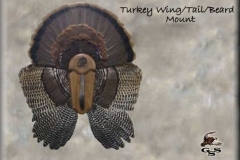 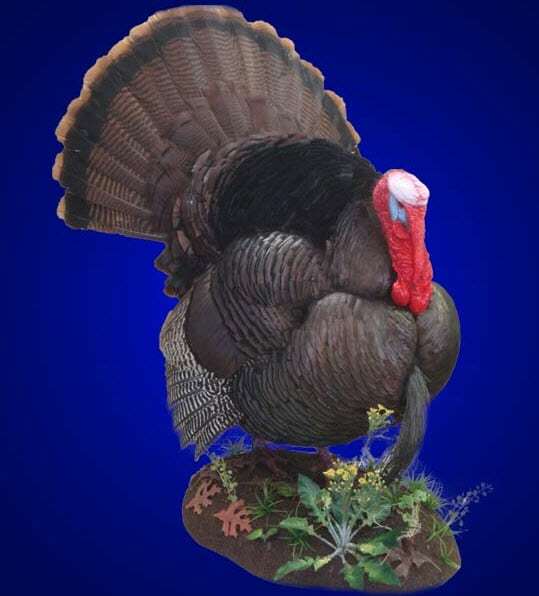 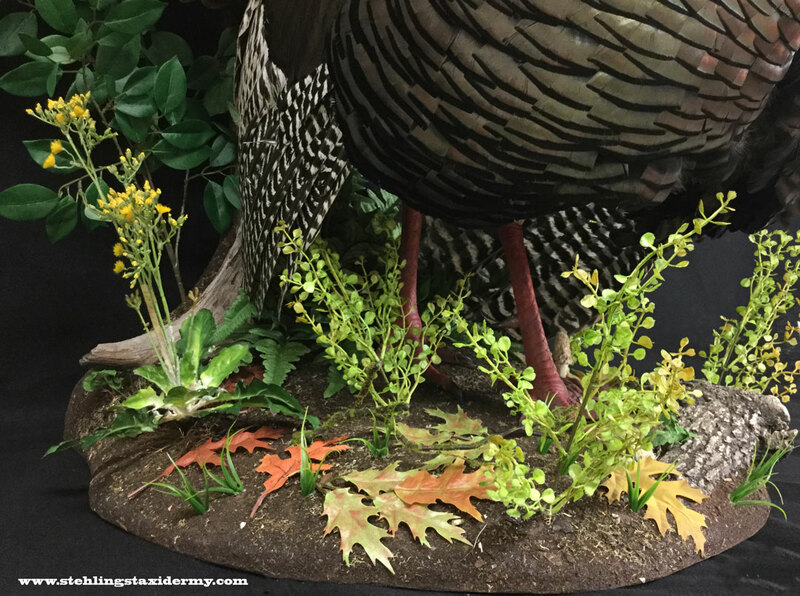 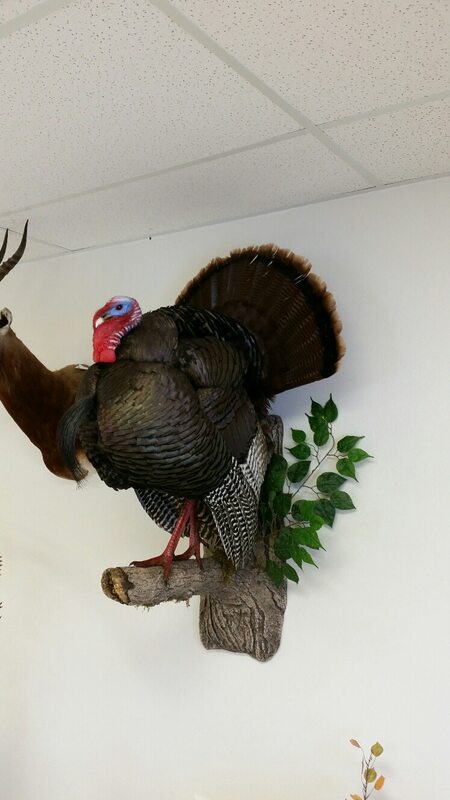 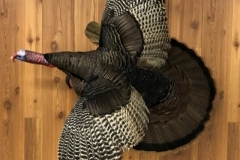 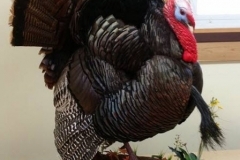 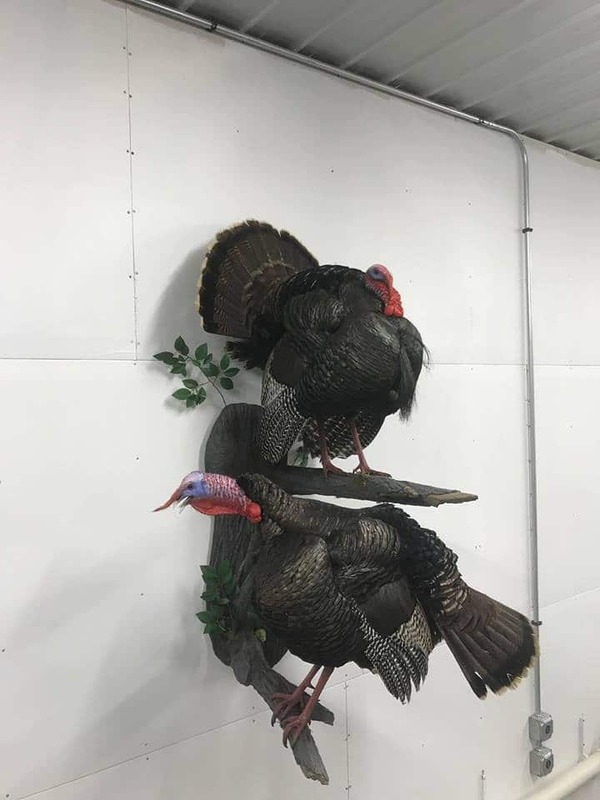 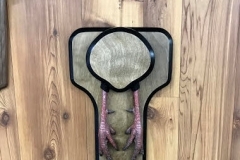 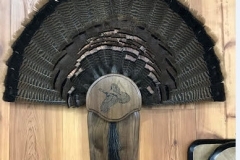 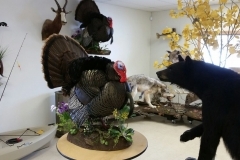 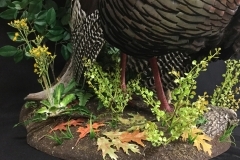 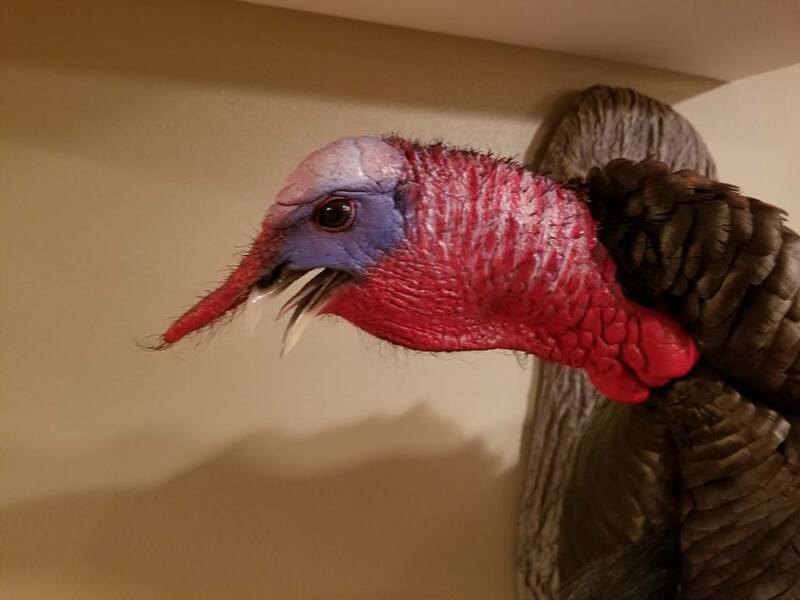 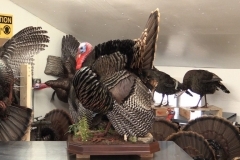 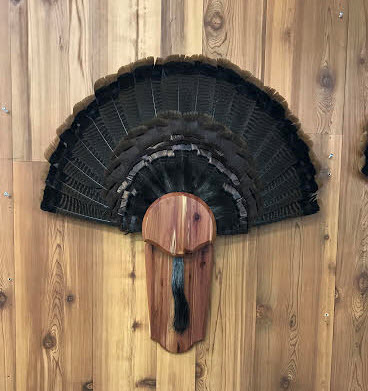 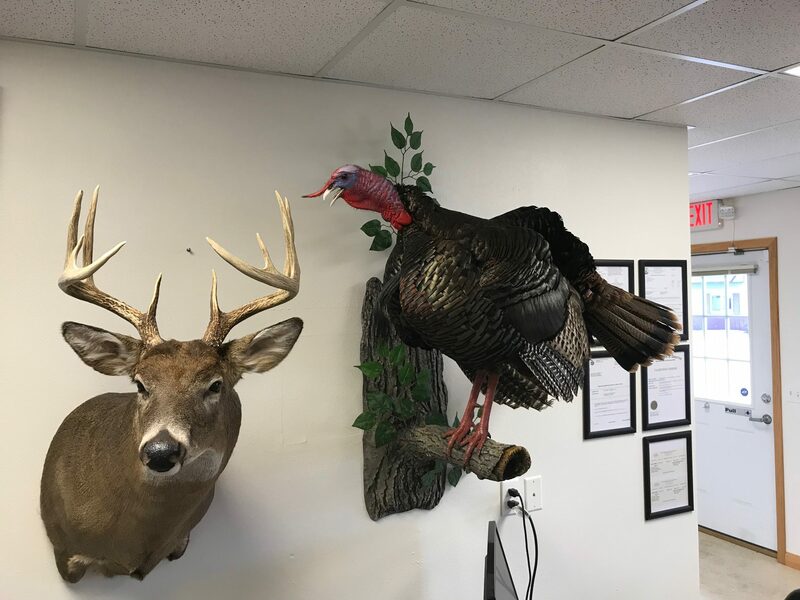 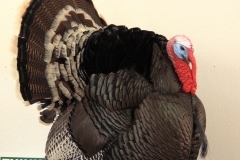 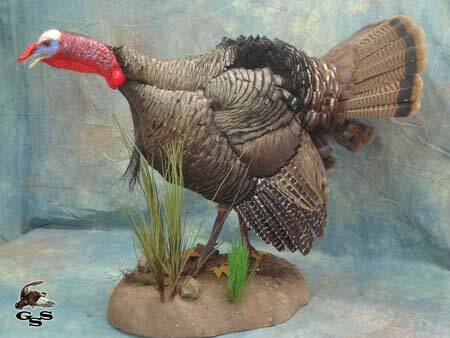 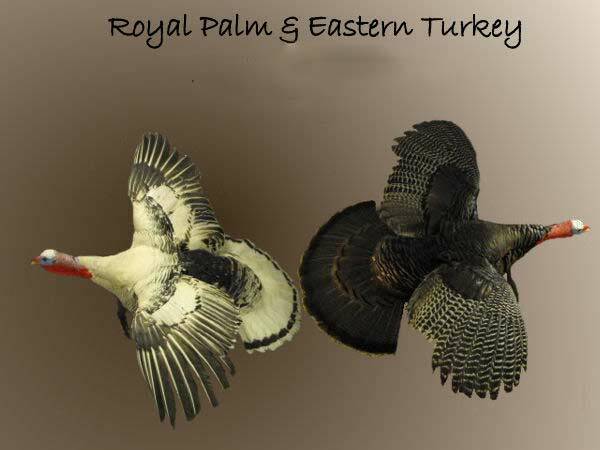 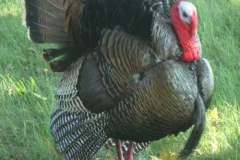 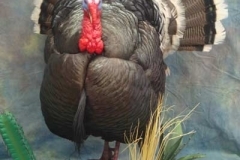 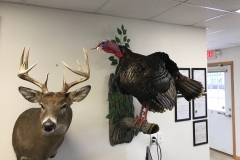 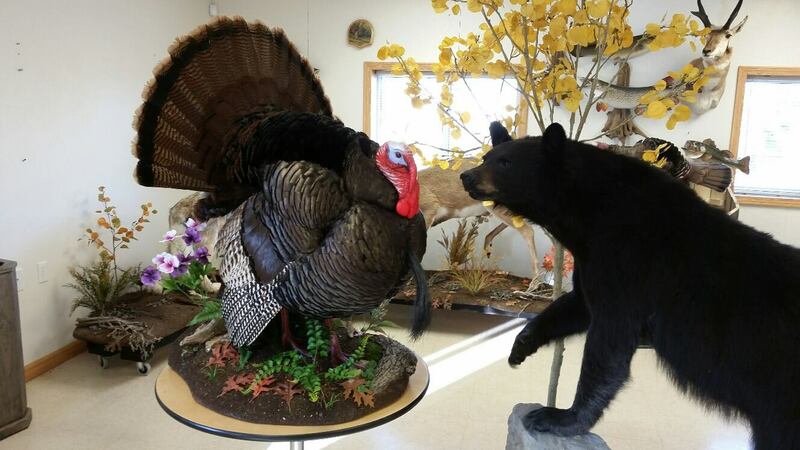 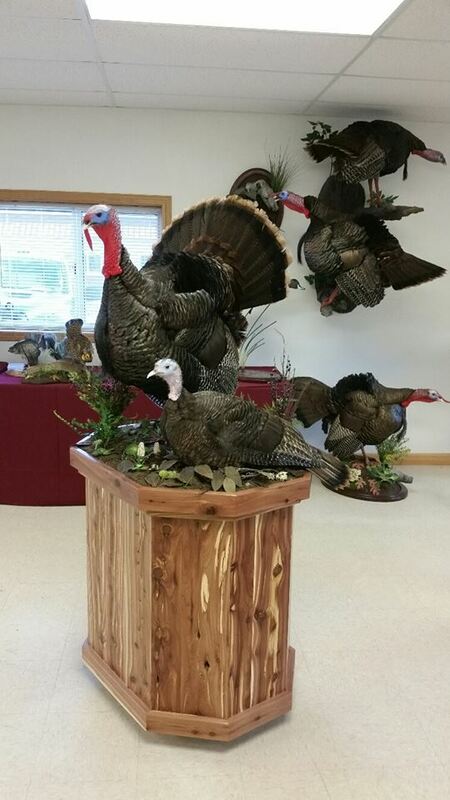 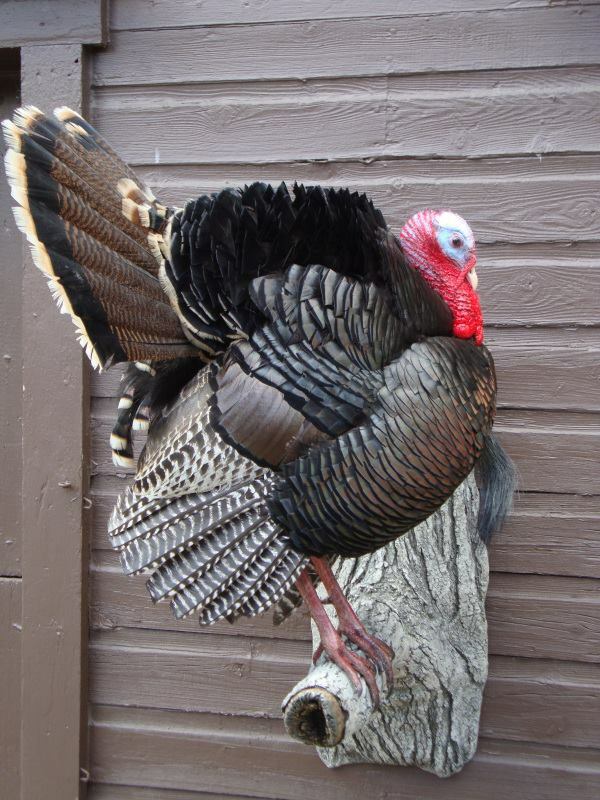 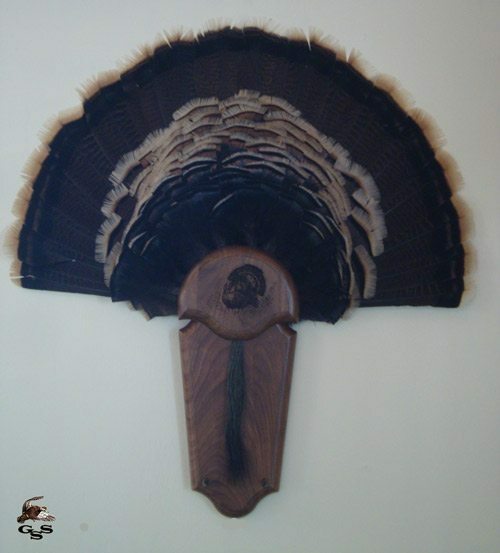 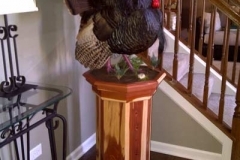 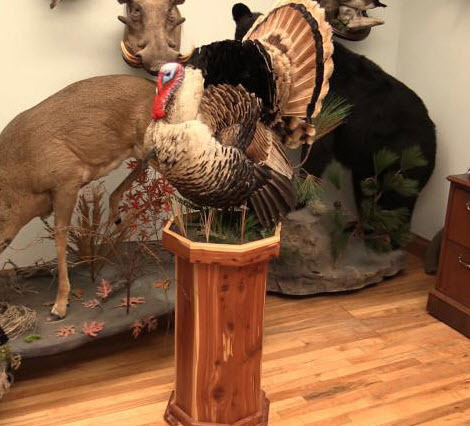 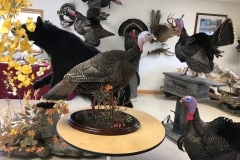 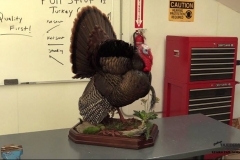 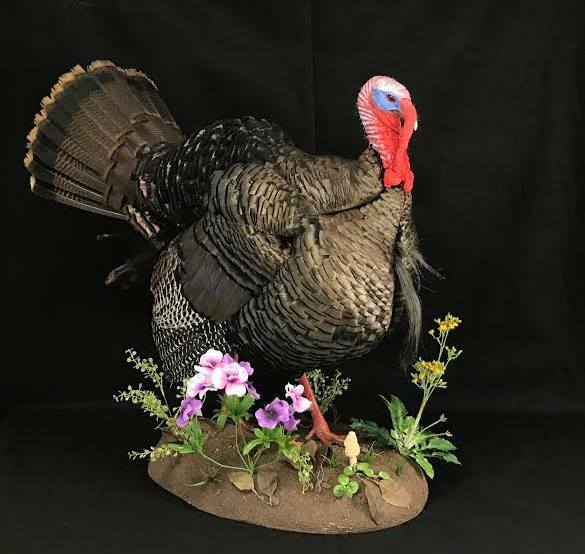 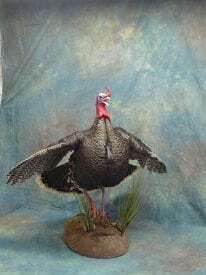 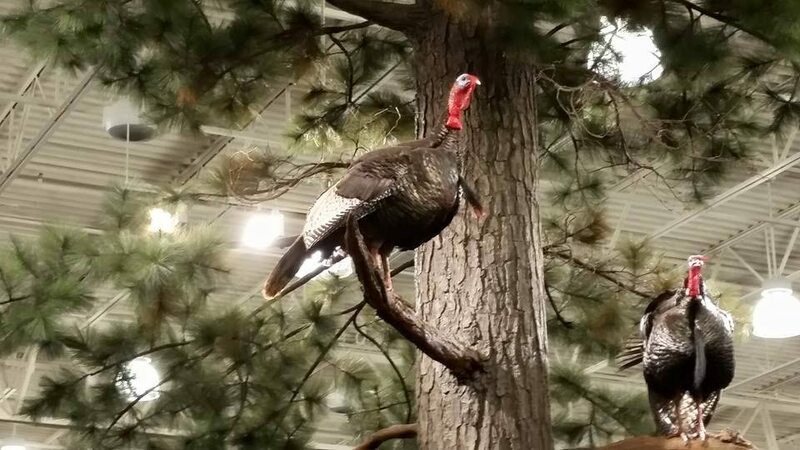 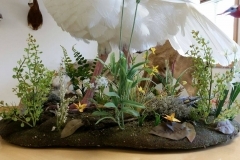 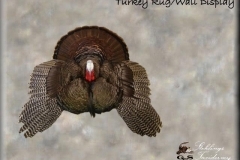 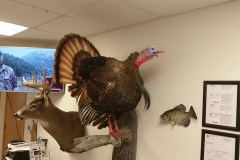 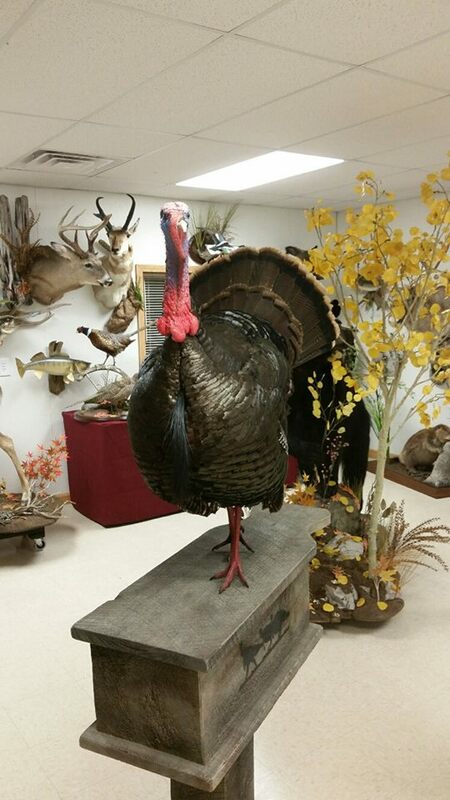 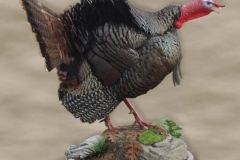 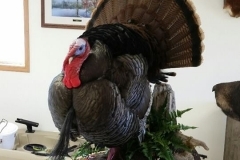 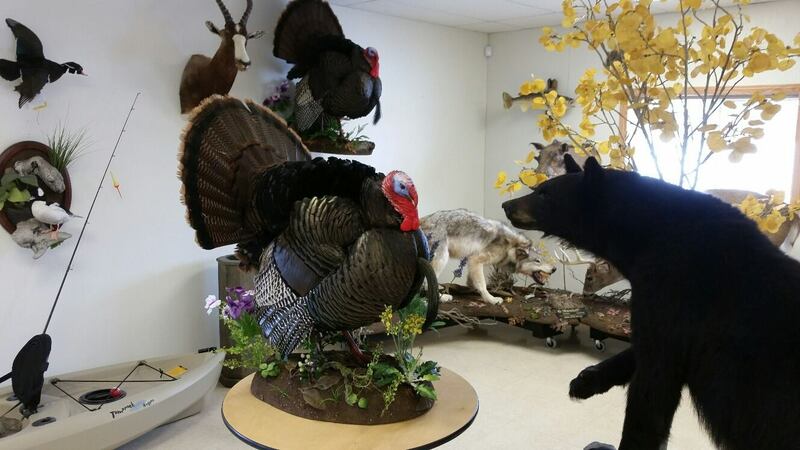 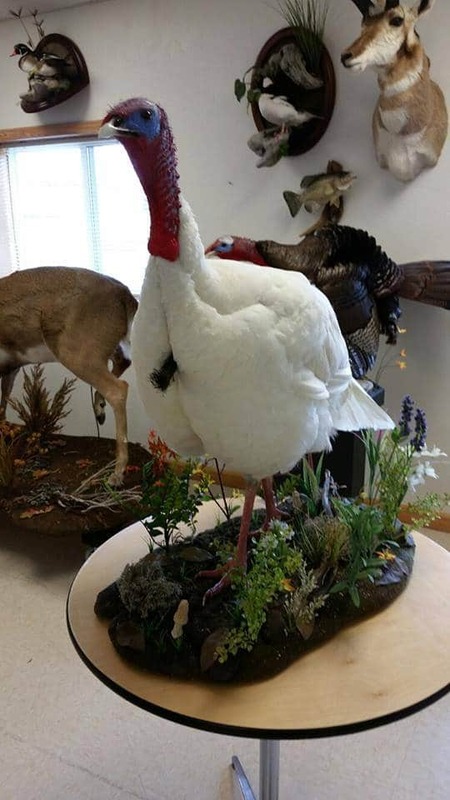 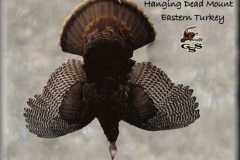 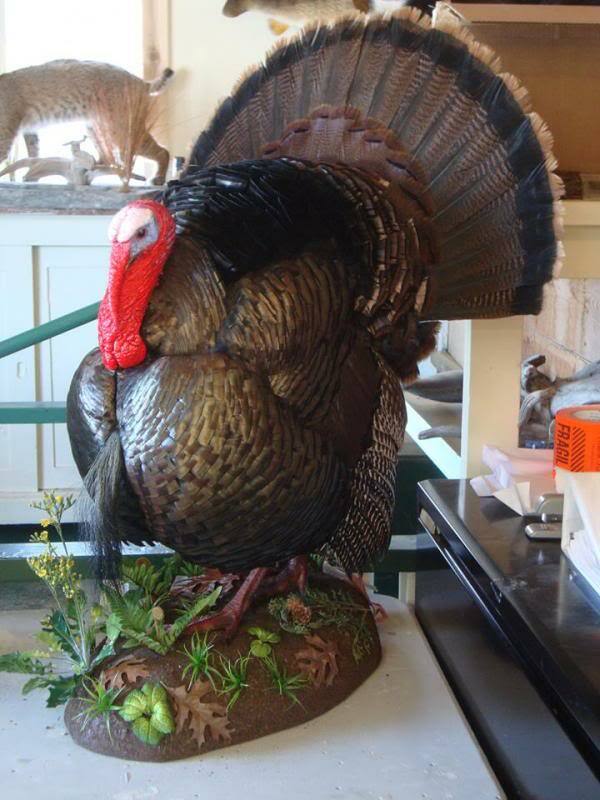 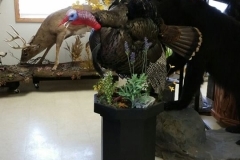 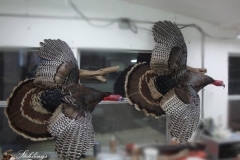 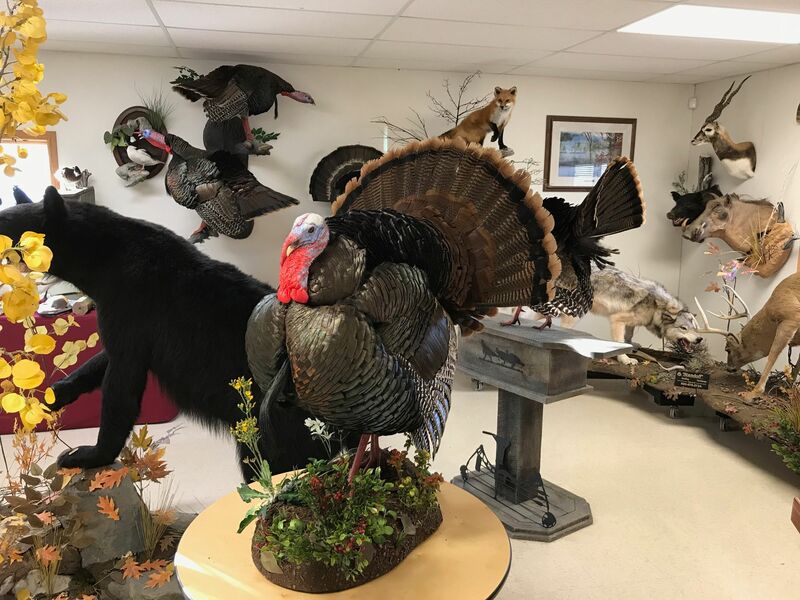 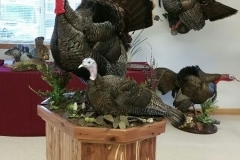 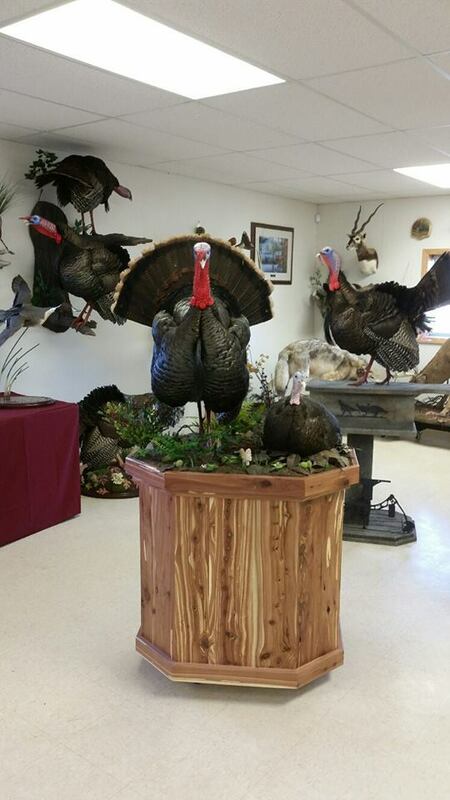 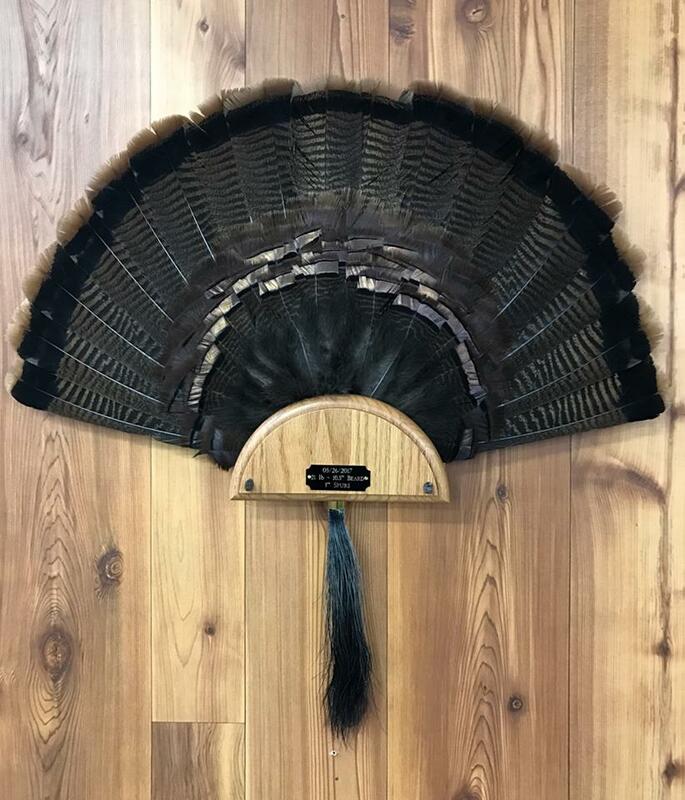 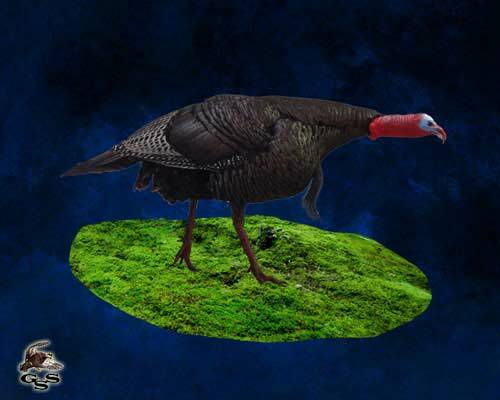 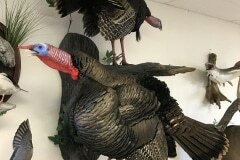 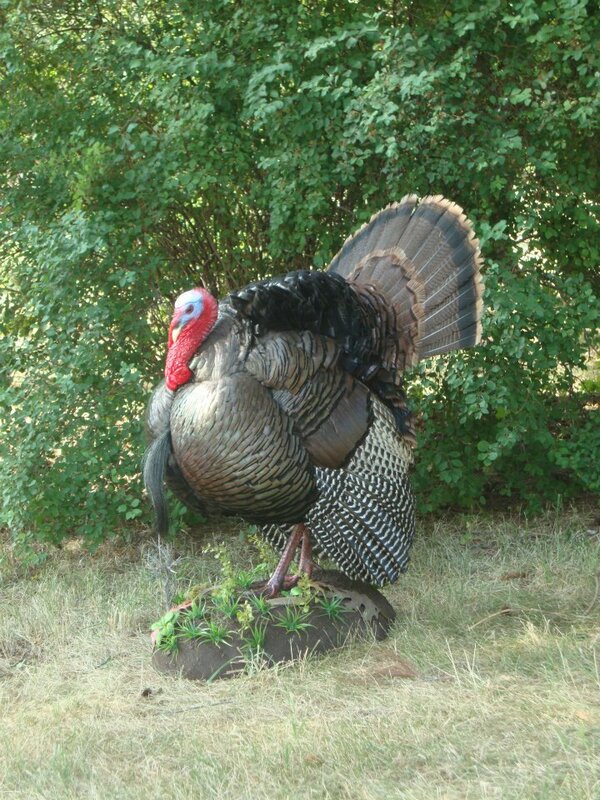 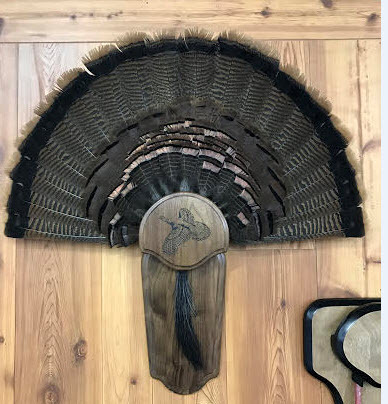 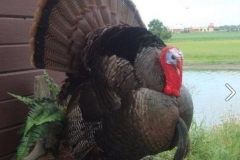 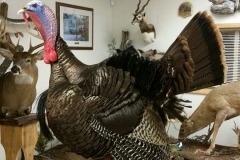 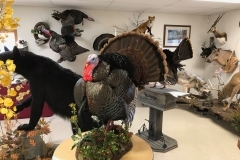 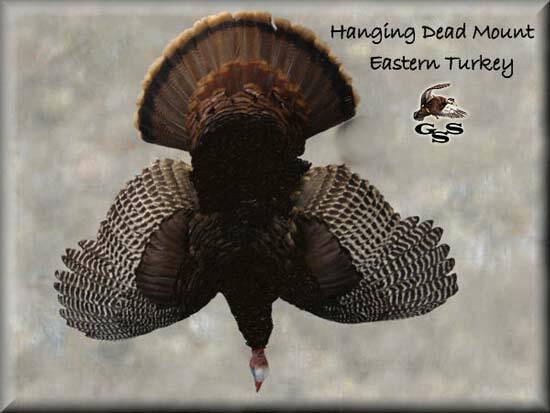 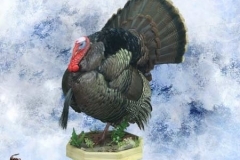 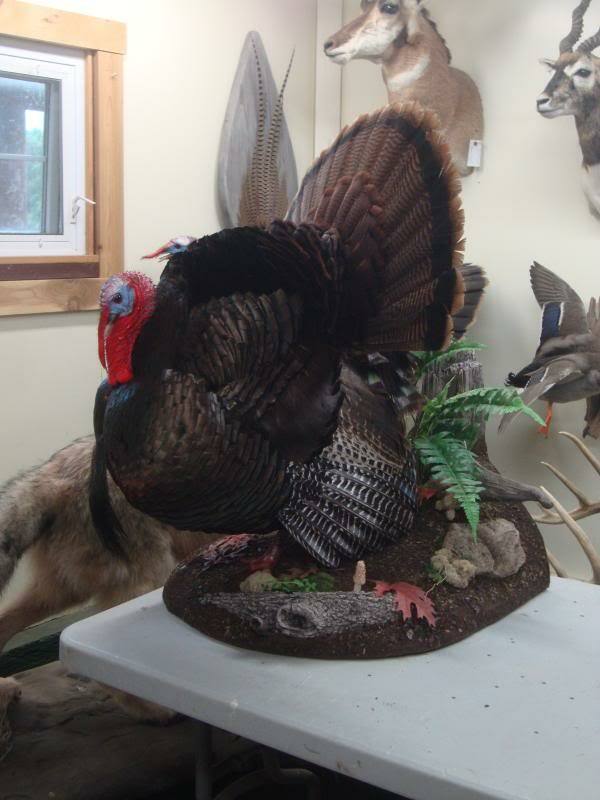 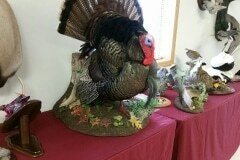 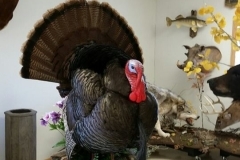 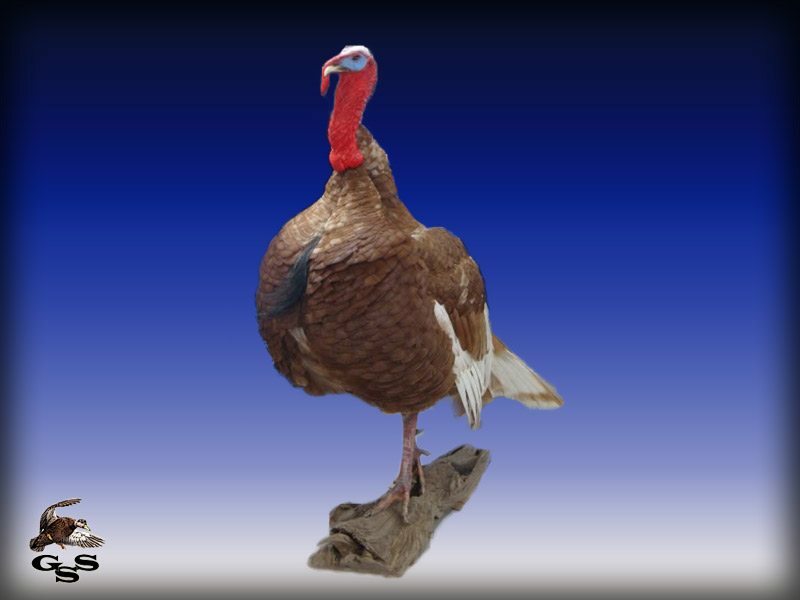 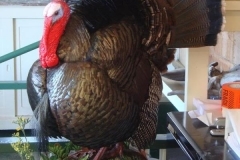 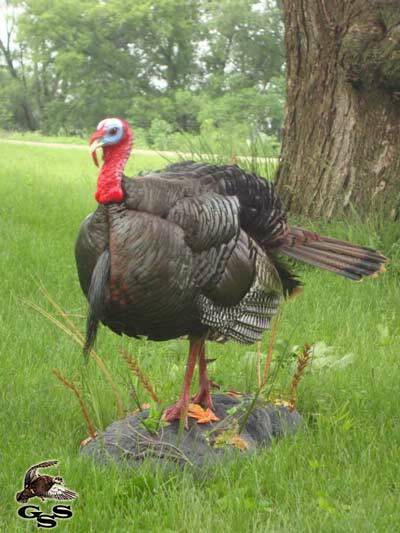 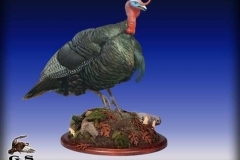 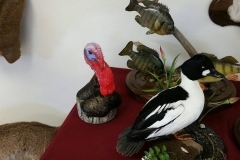 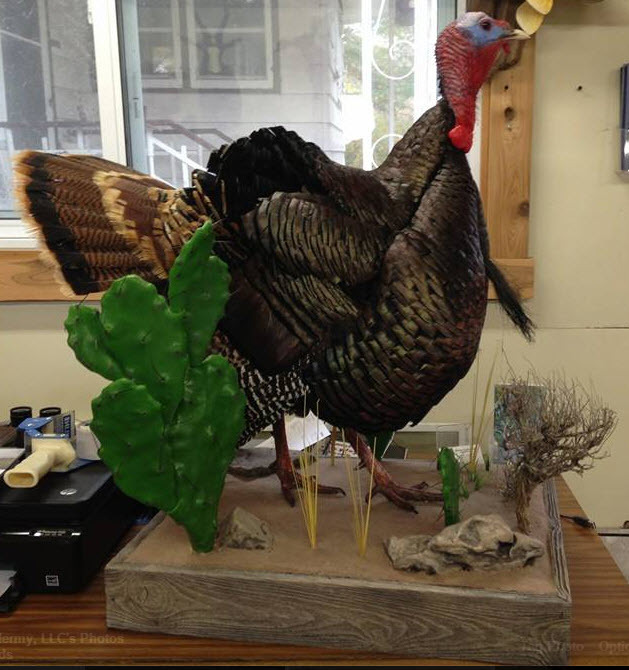 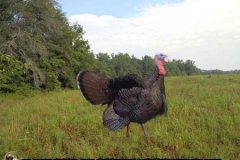 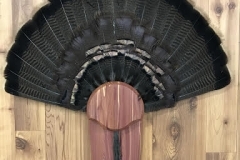 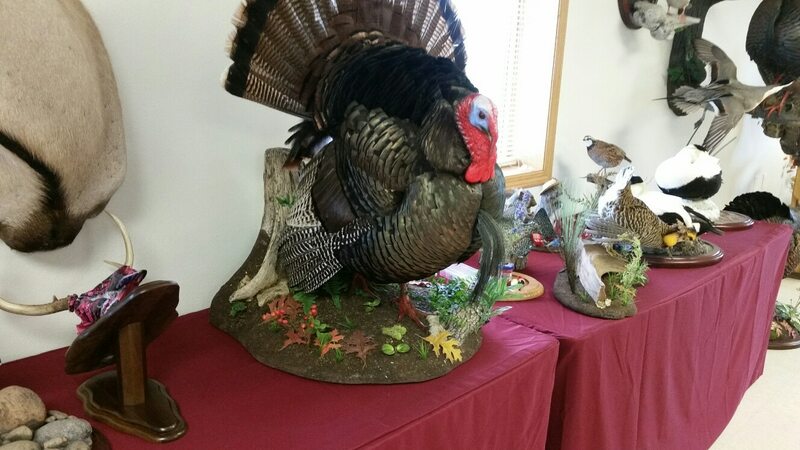 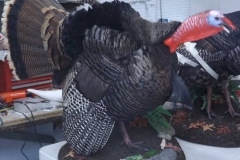 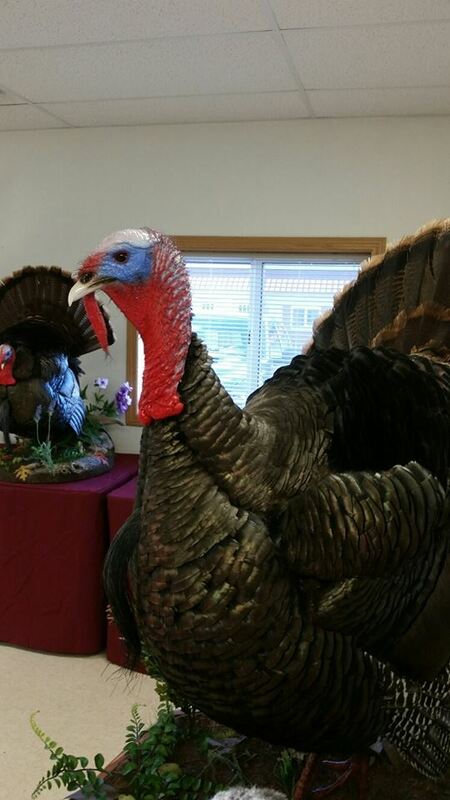 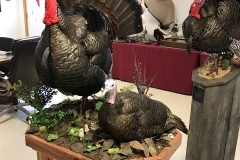 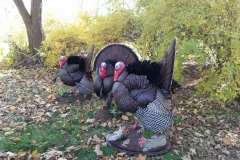 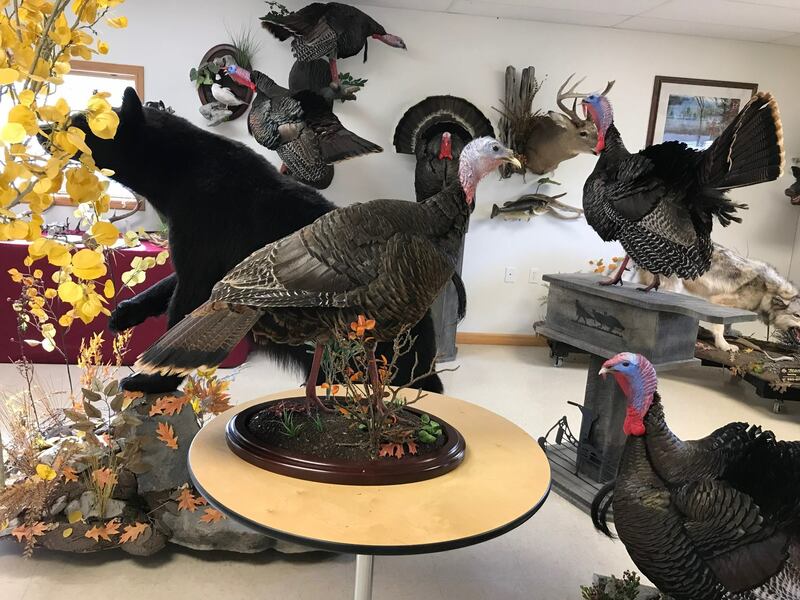 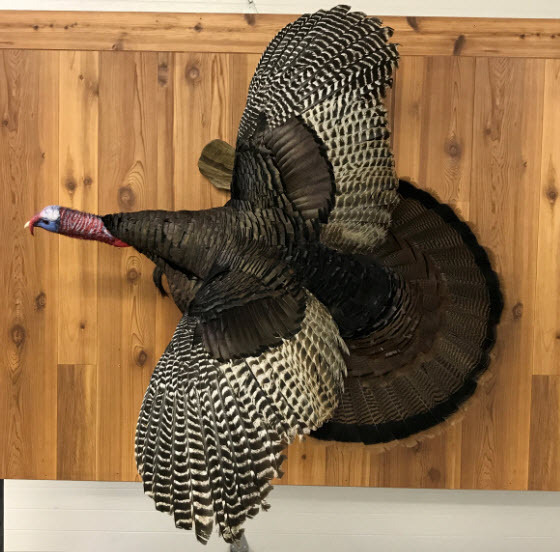 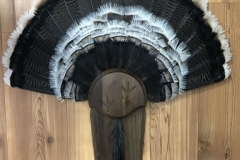 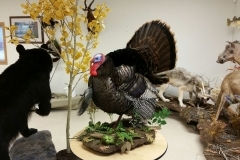 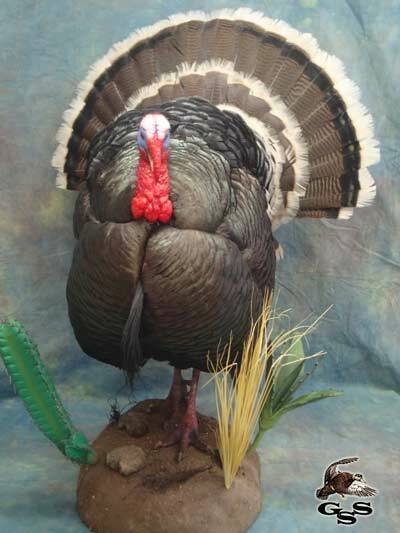 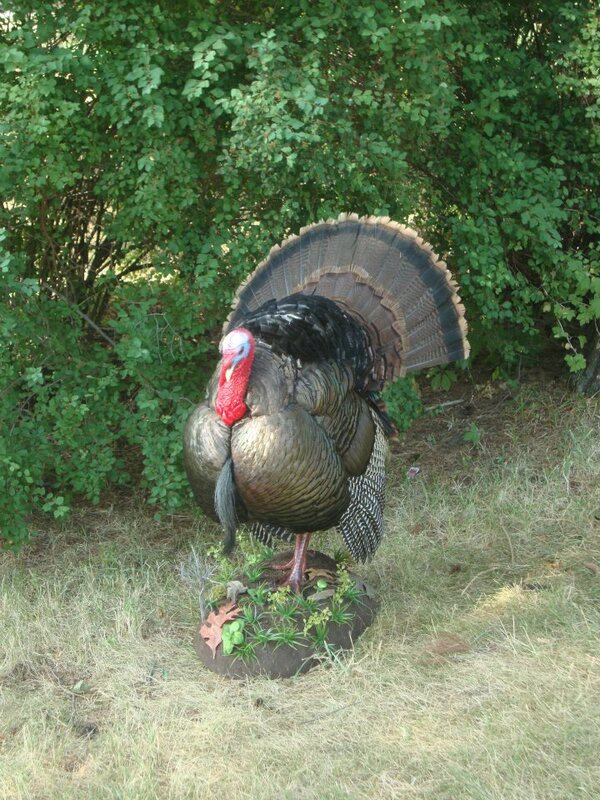 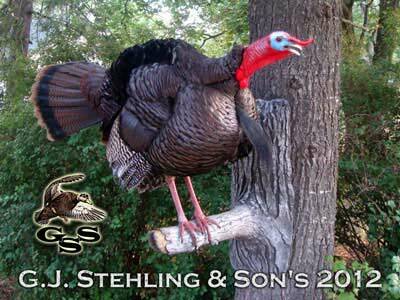 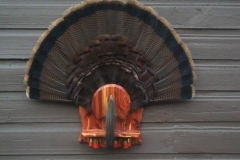 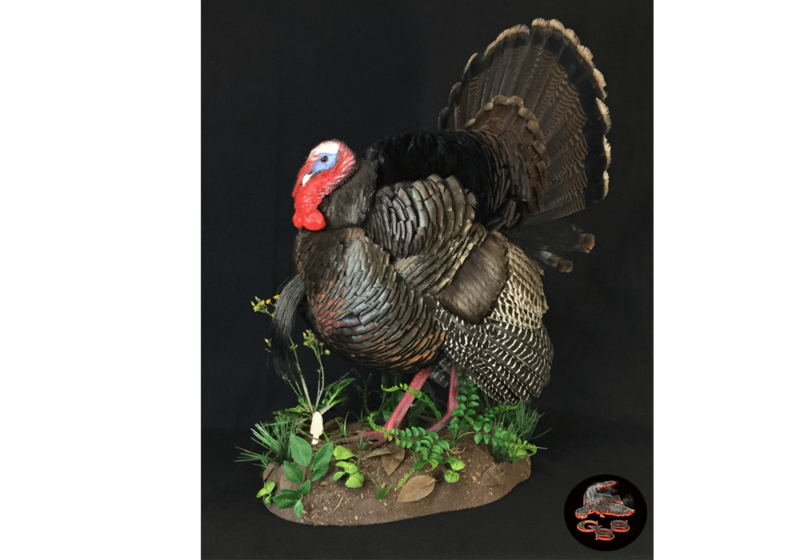 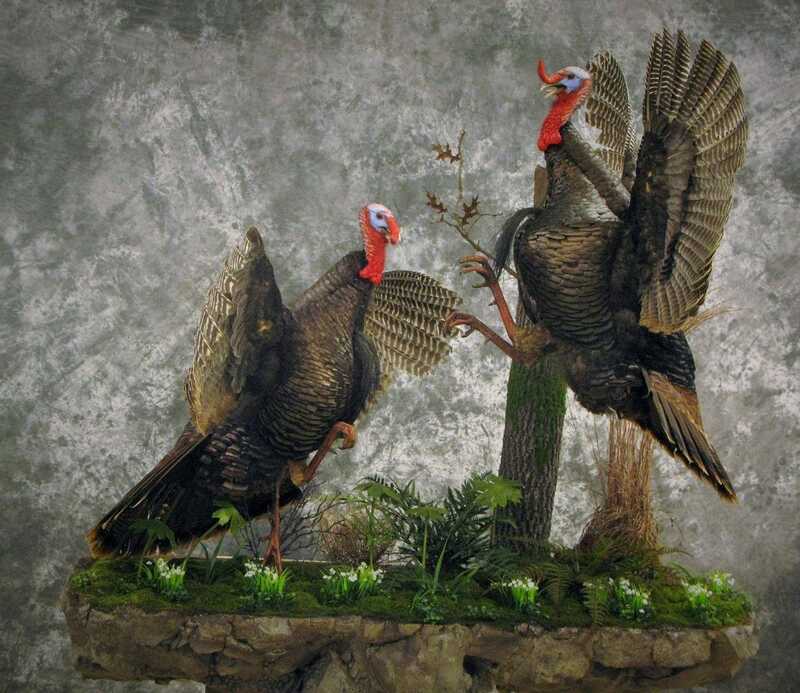 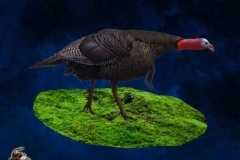 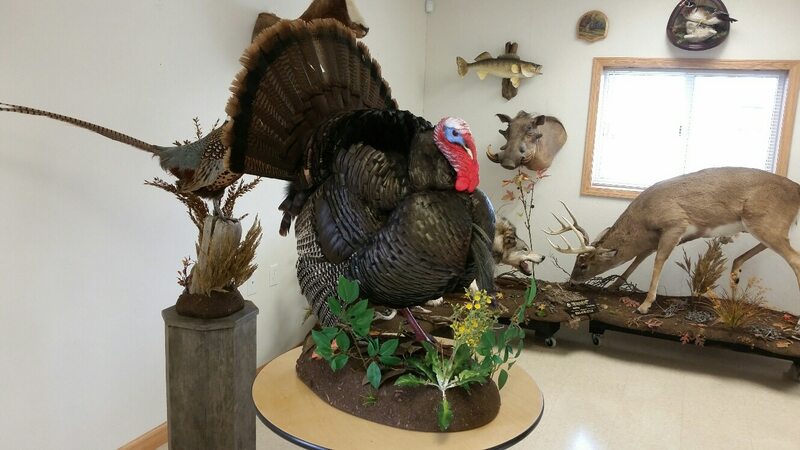 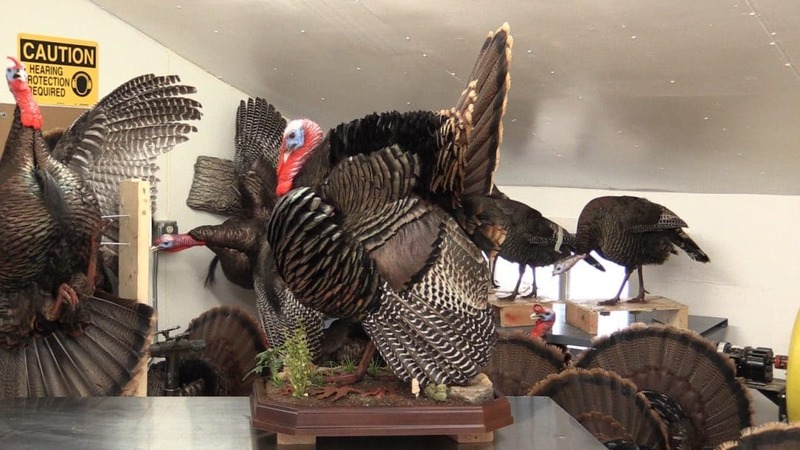 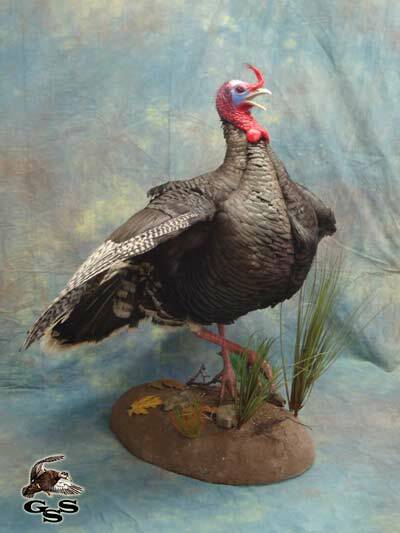 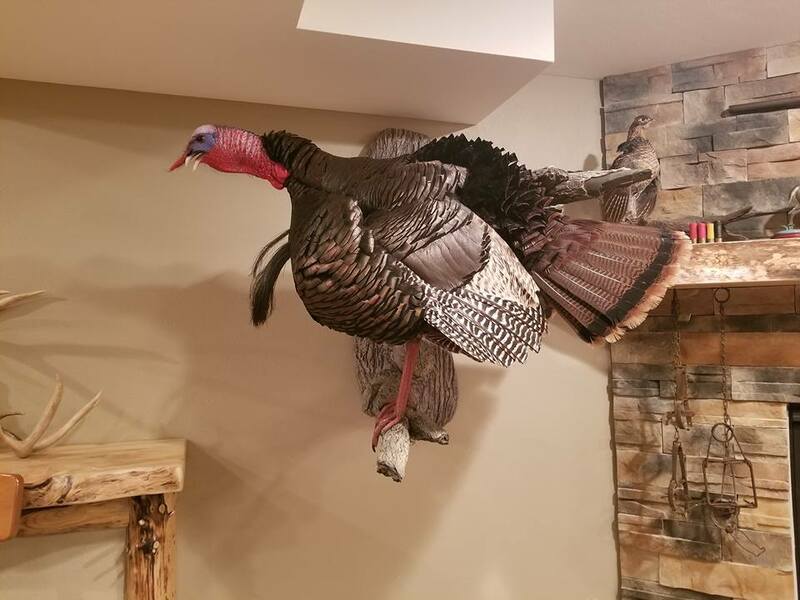 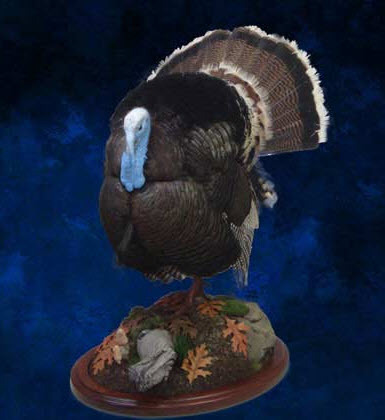 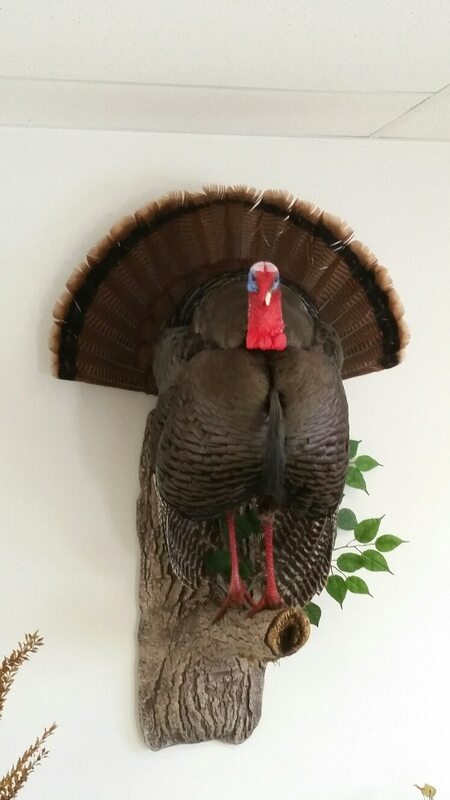 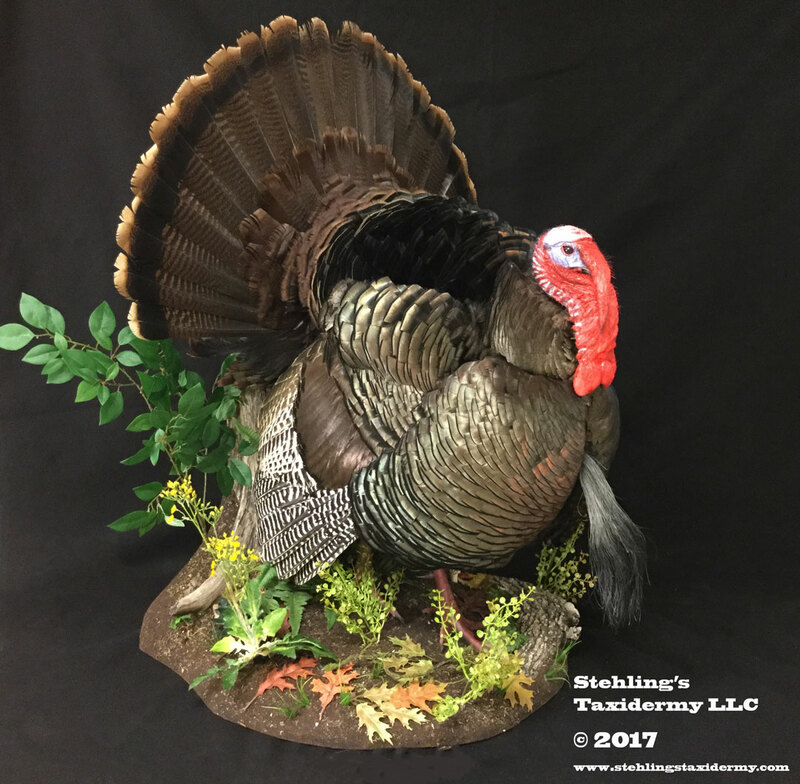 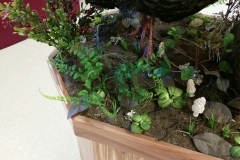 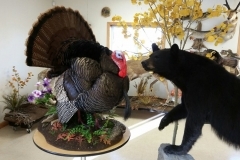 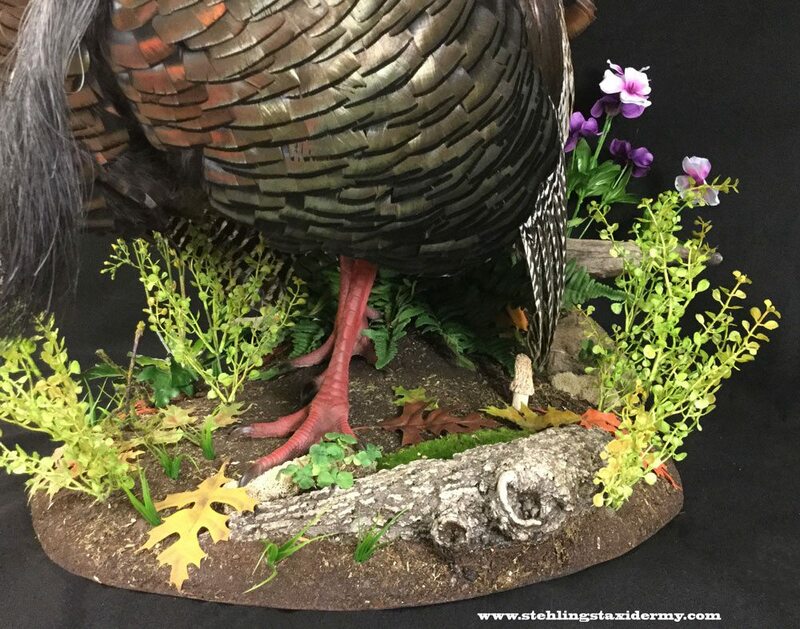 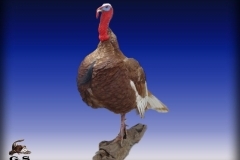 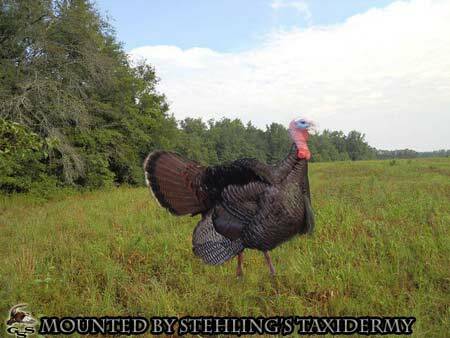 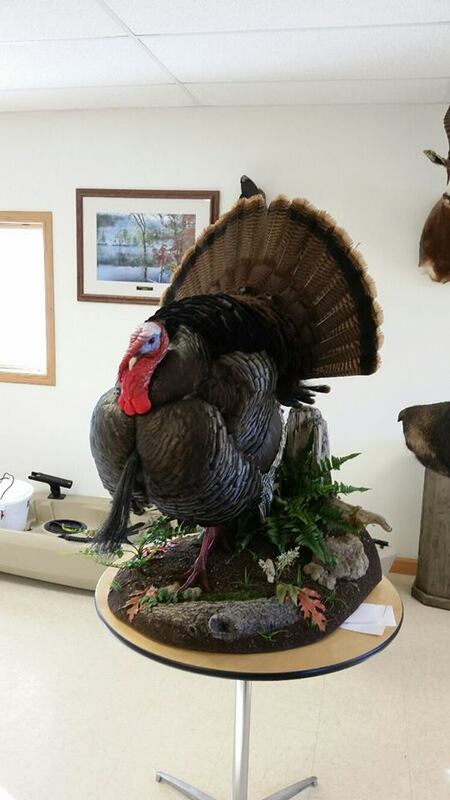 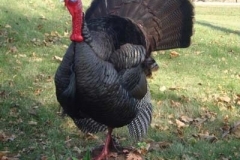 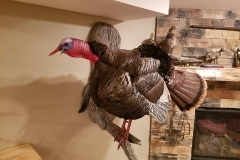 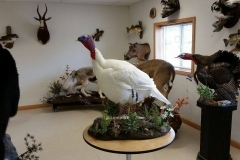 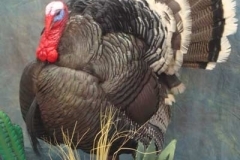 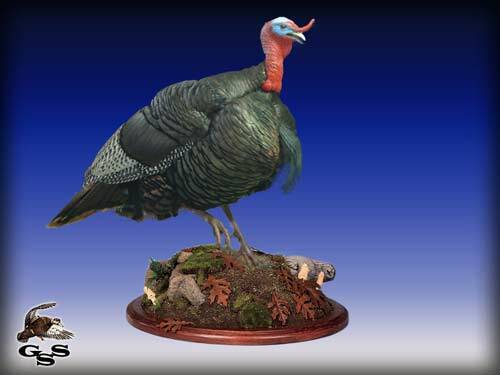 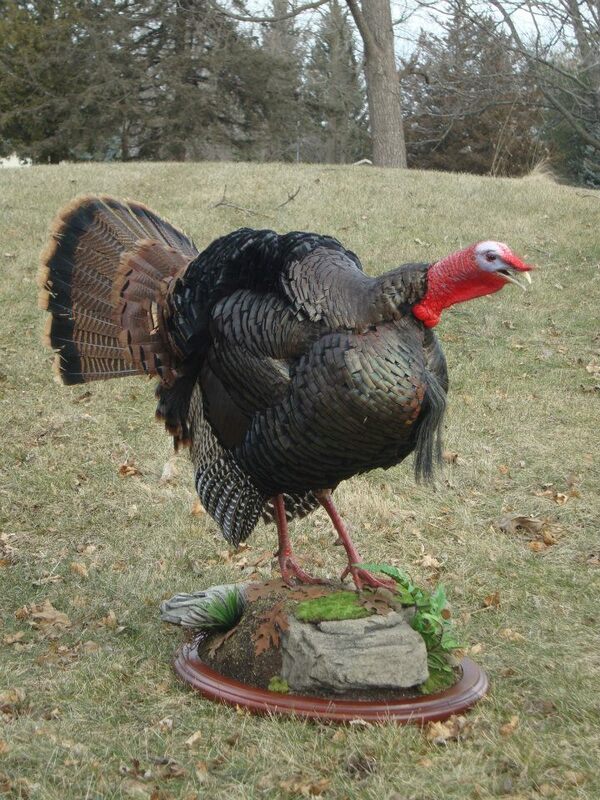 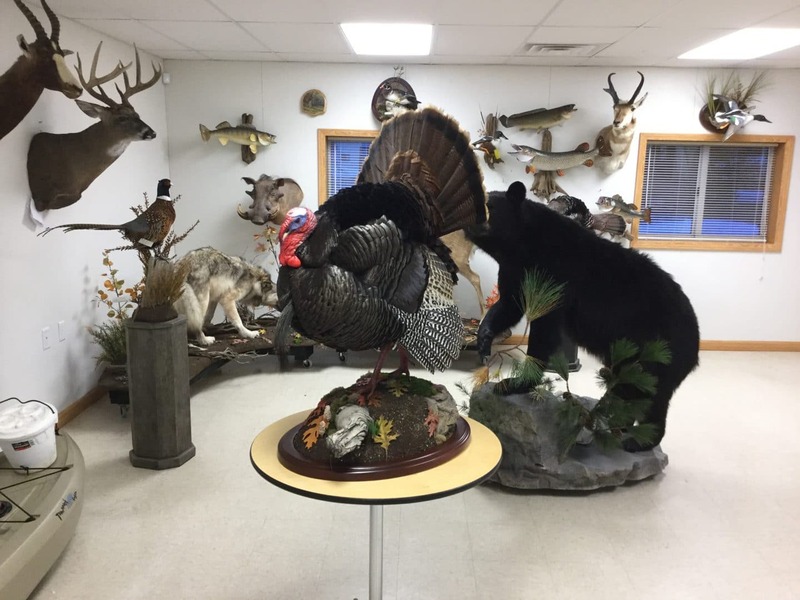 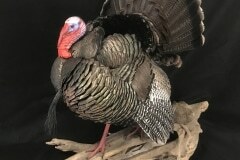 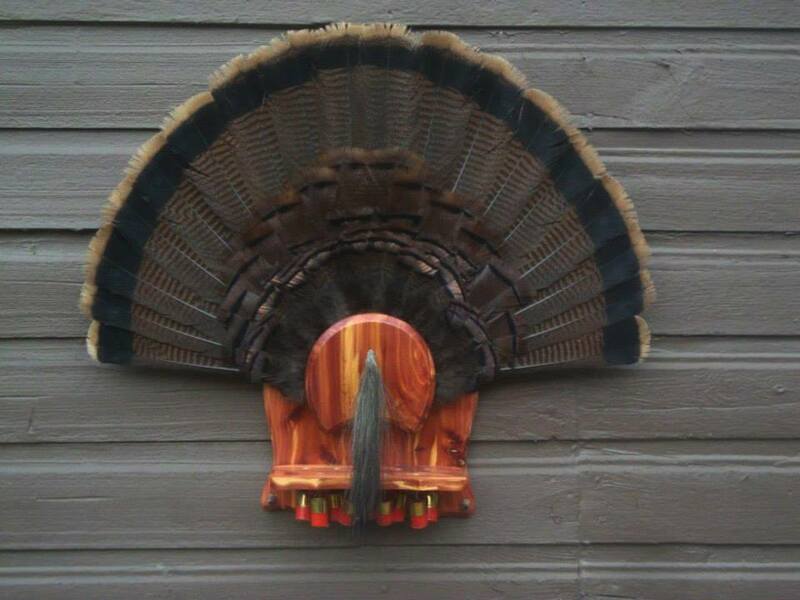 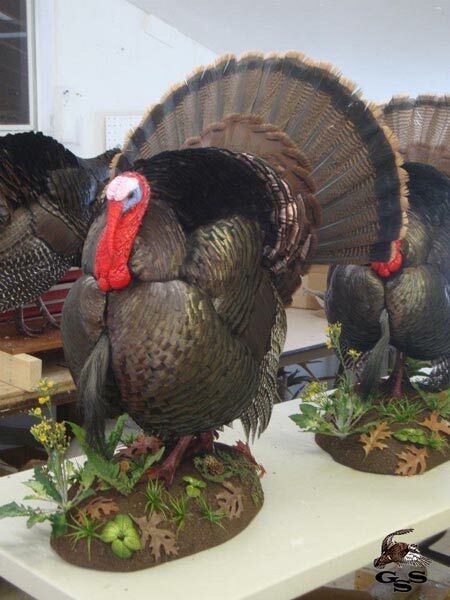 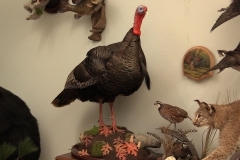 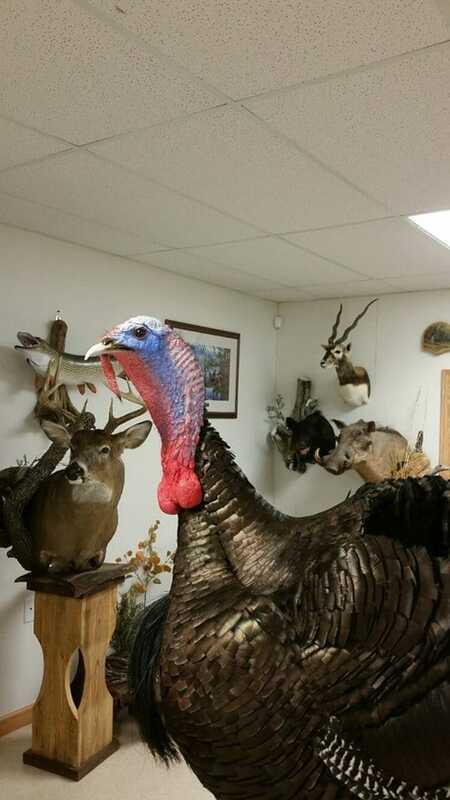 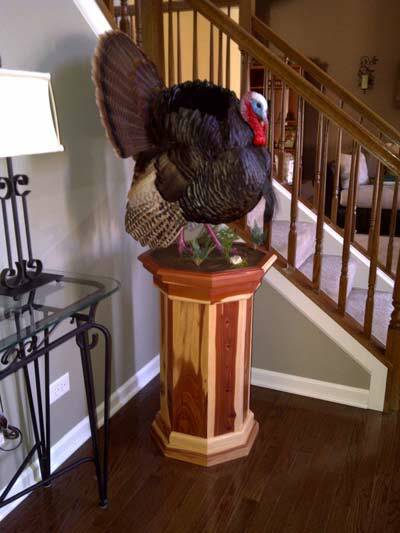 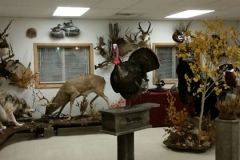 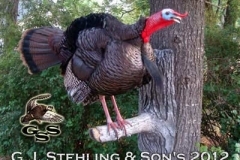 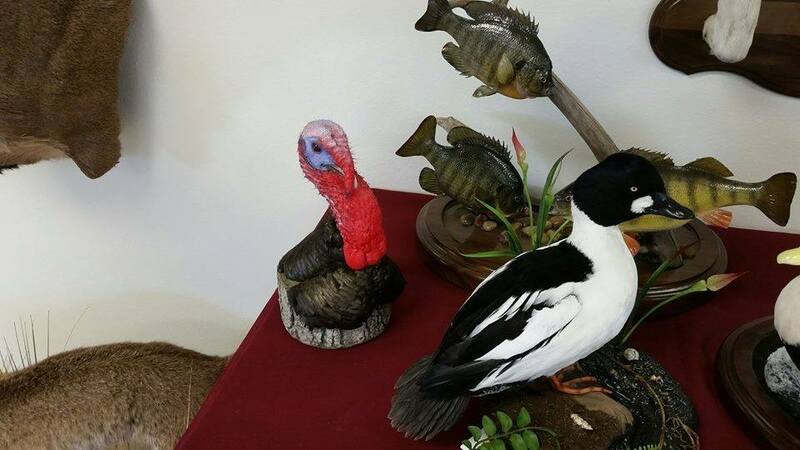 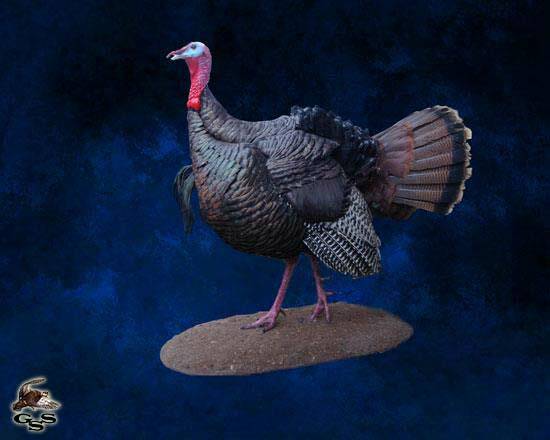 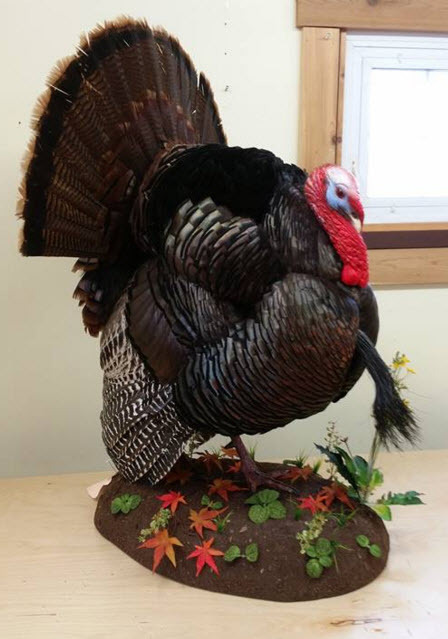 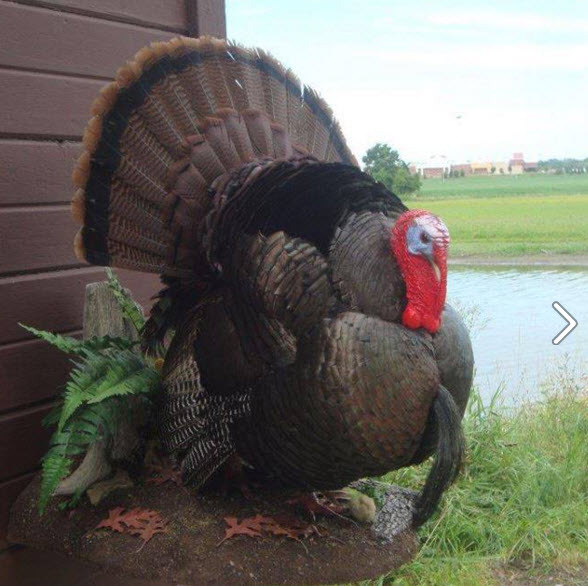 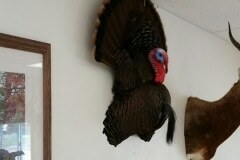 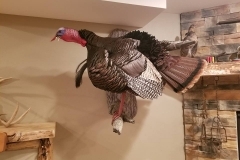 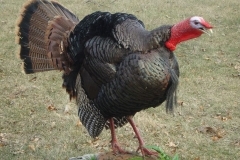 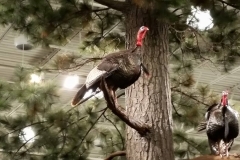 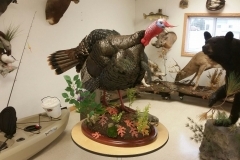 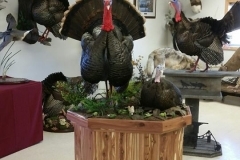 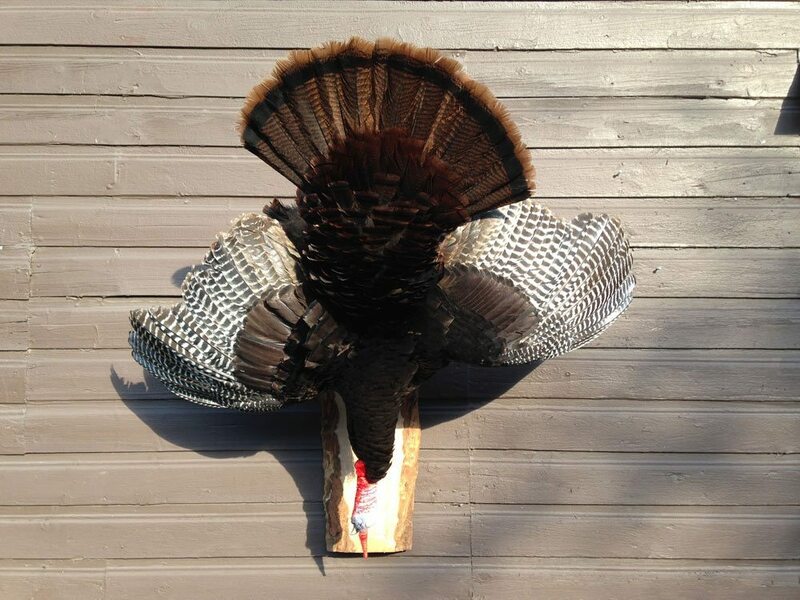 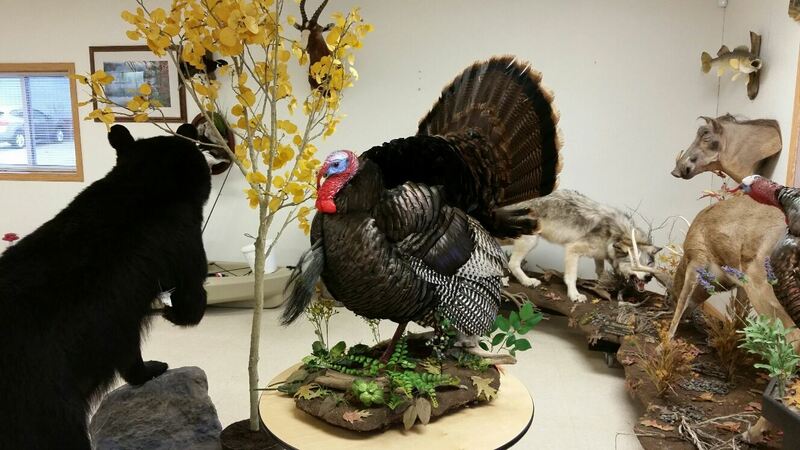 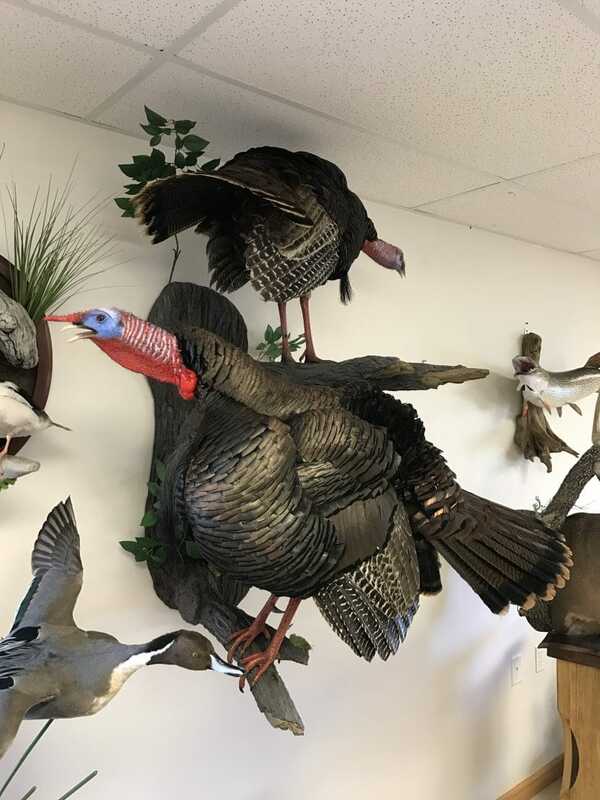 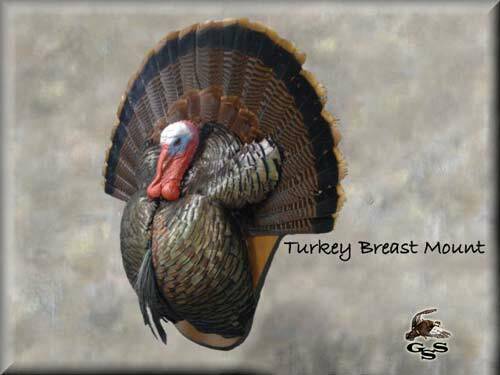 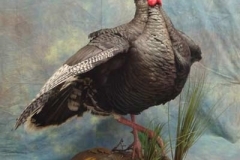 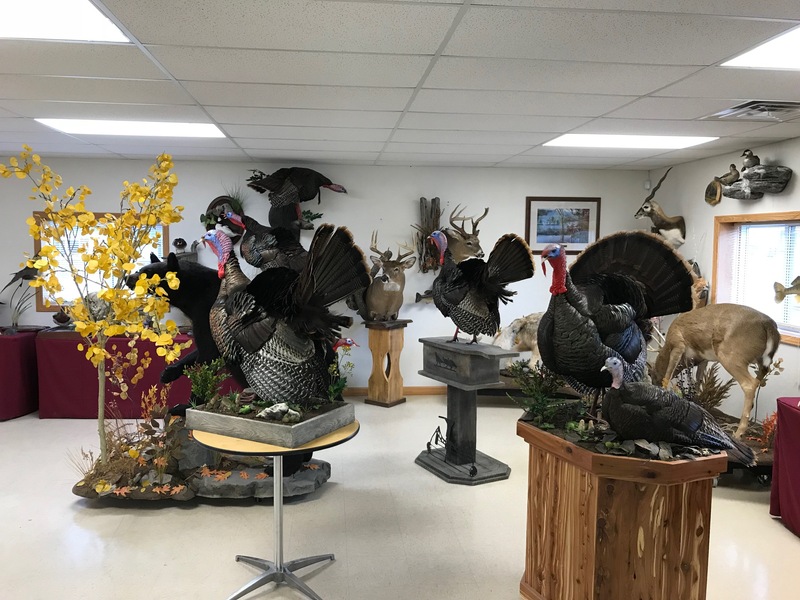 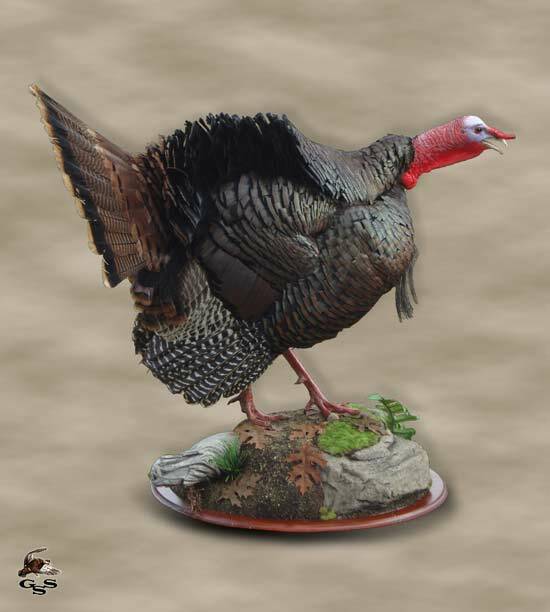 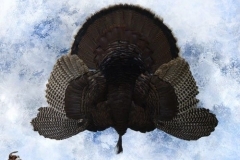 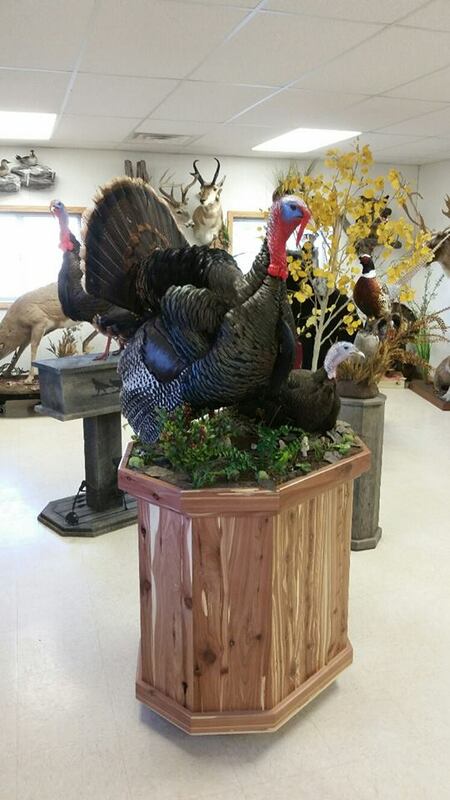 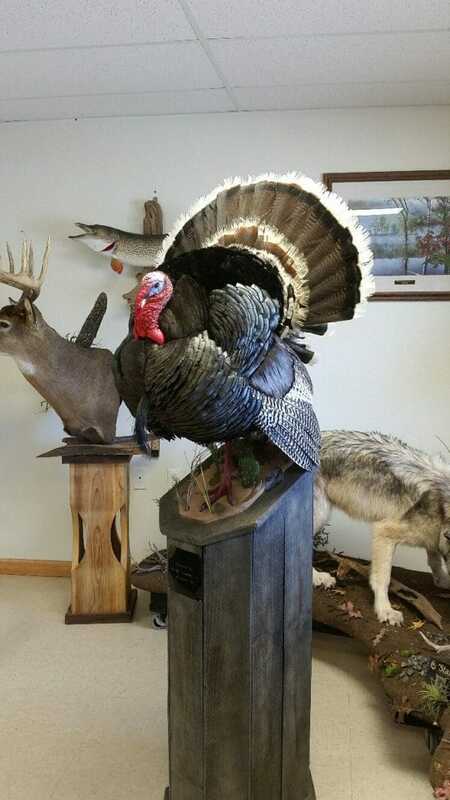 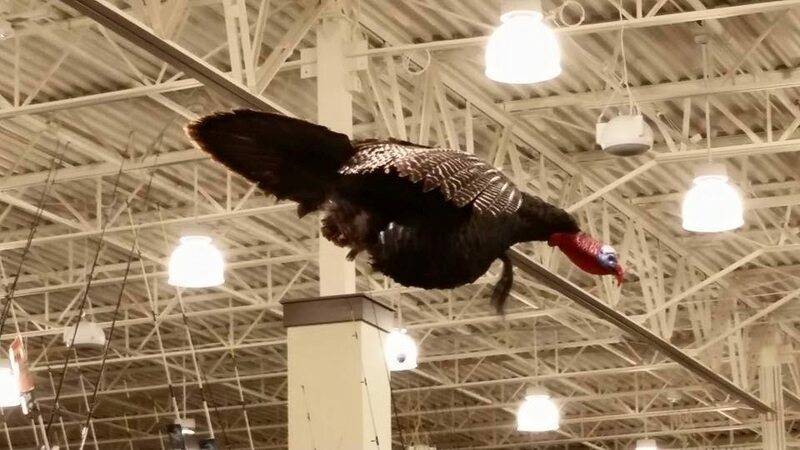 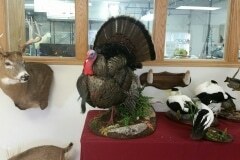 Turkey Taxidermy Mounts-We have extensive experience in the field of turkey taxidermy, creating hundreds of custom mounts for Sportsmen in Wisconsin and across the nation every year. 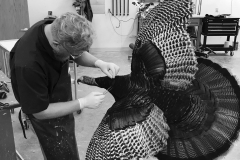 Our staff pays close attention to detail and accuracy on every mount. 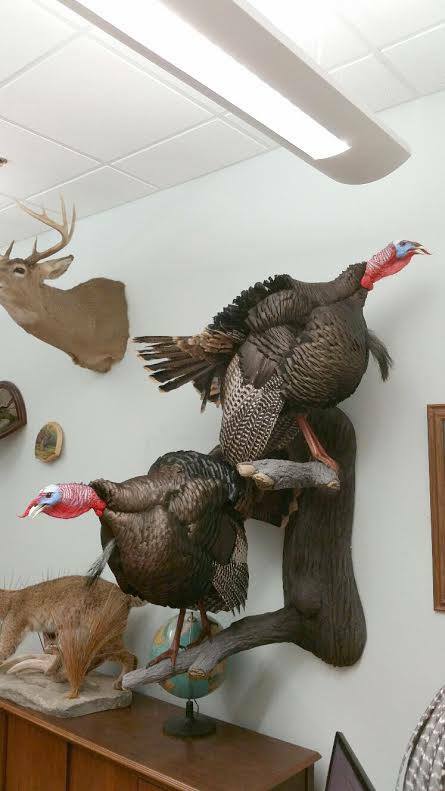 We spend many hours every year studying our reference turkeys to provide the most accurate mounts possible. 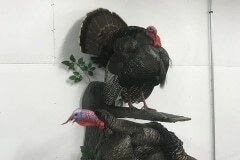 Custom poses and bases are welcome. 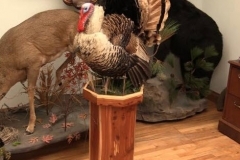 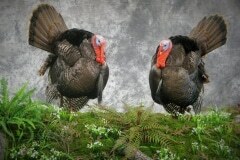 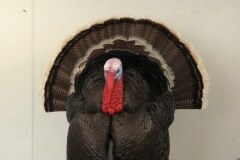 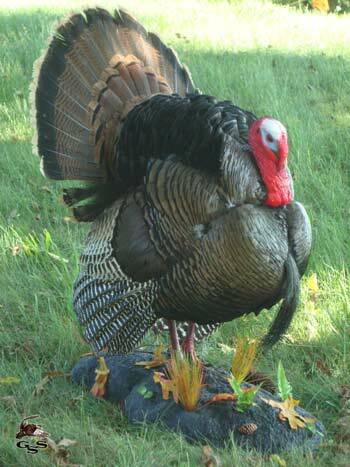 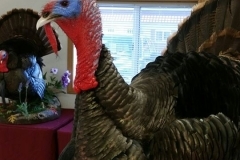 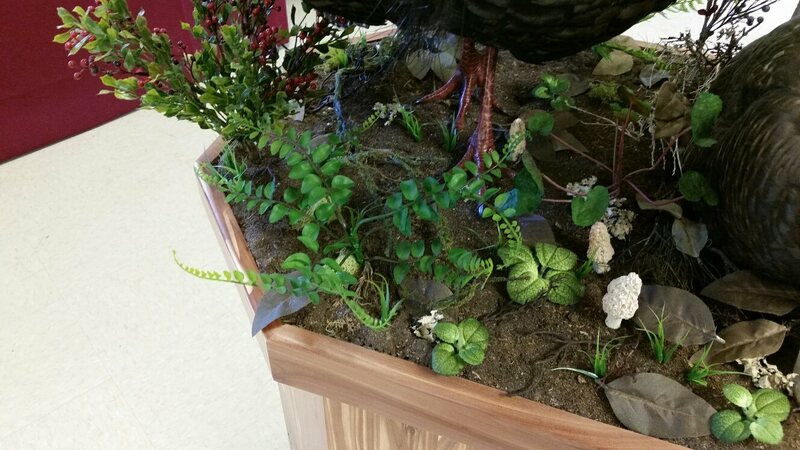 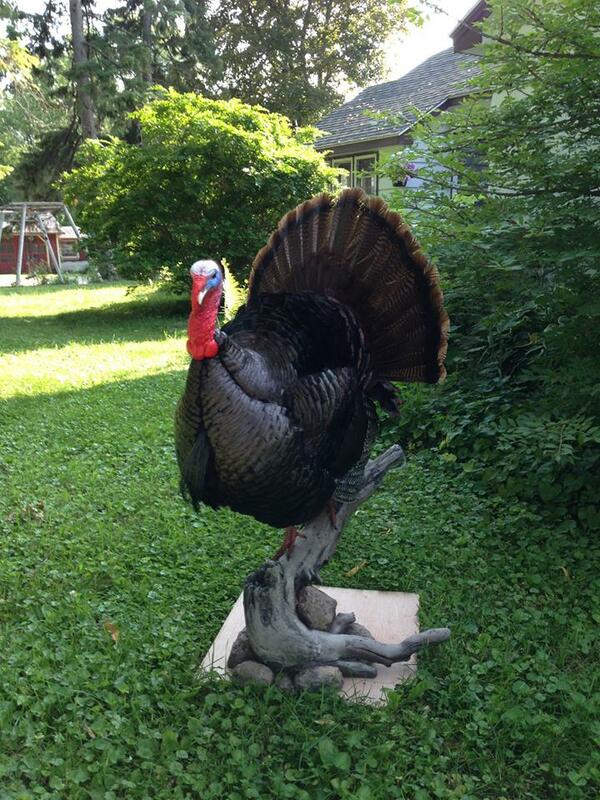 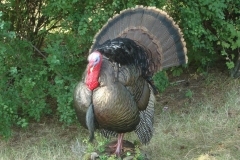 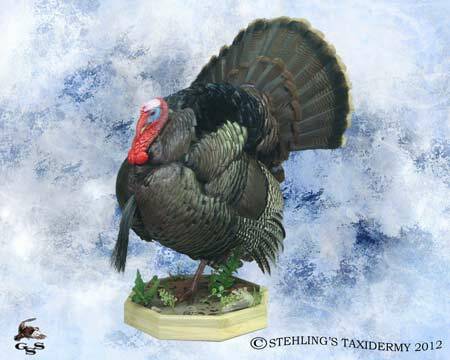 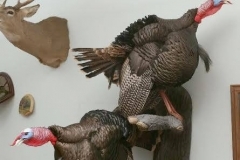 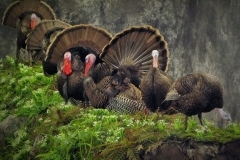 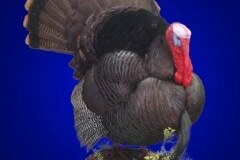 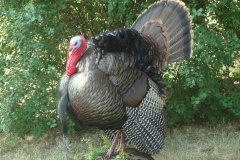 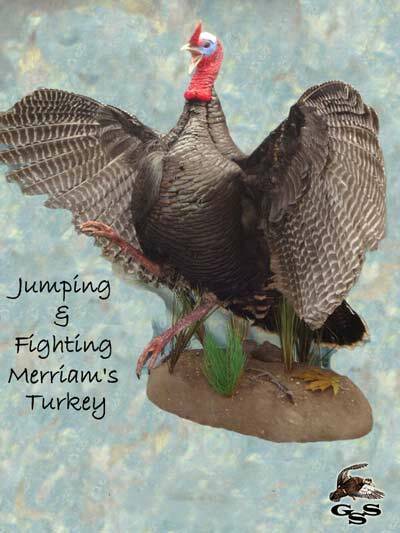 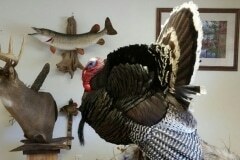 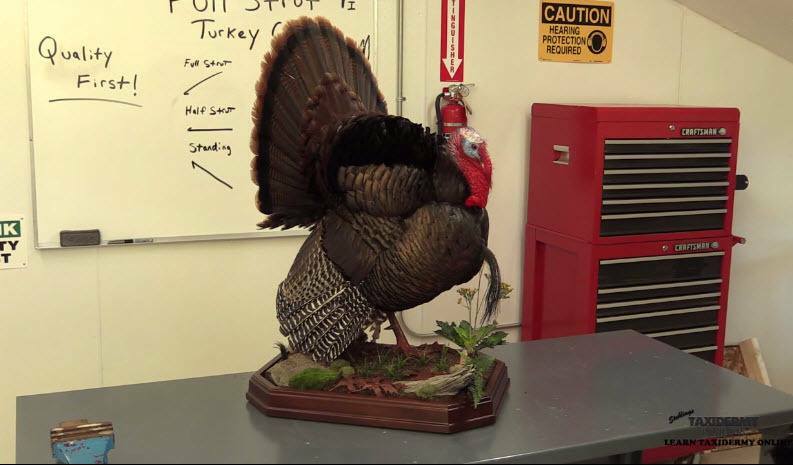 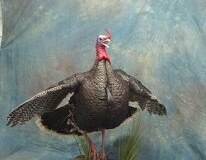 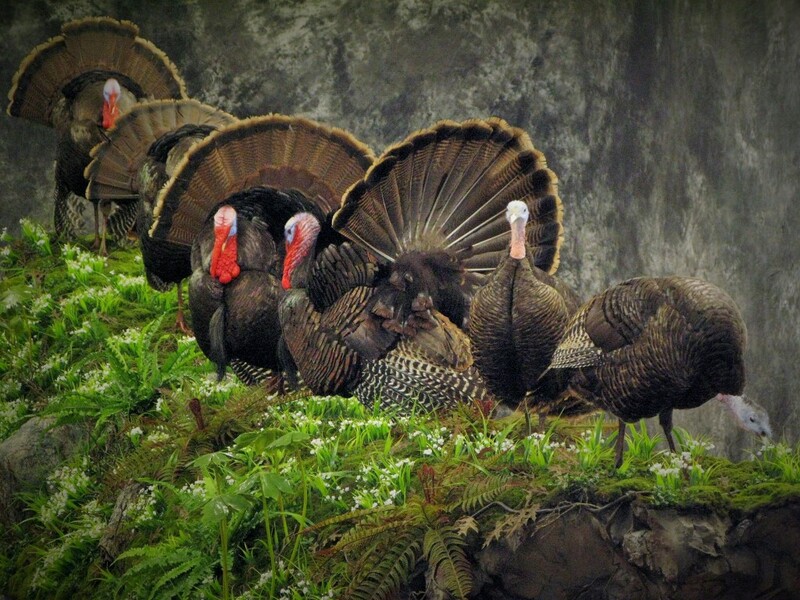 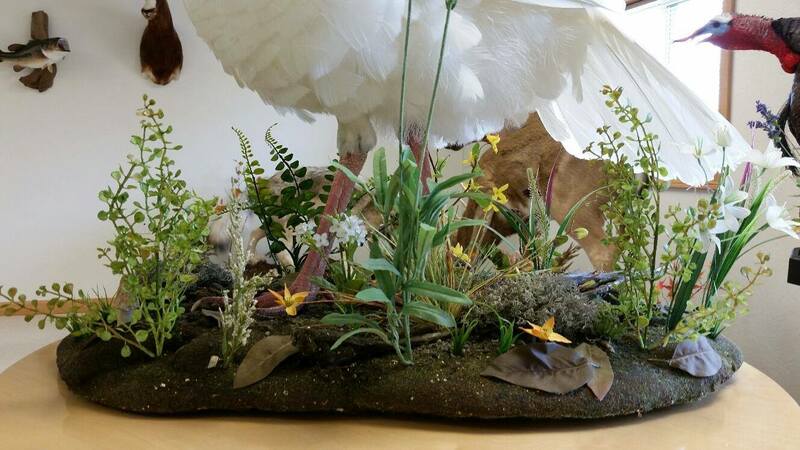 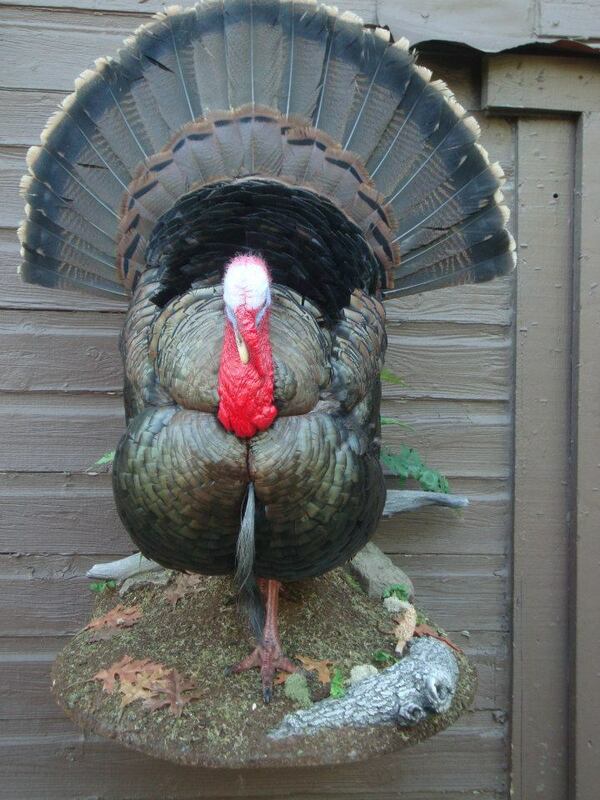 We have turkey taxidermy experience with all of the sub species. 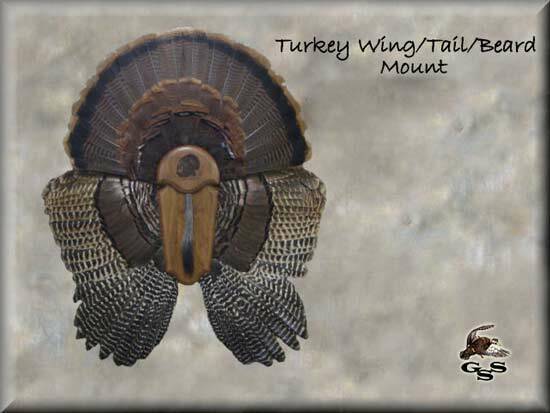 We want to work with you to create a custom mount that will capture the hunt. 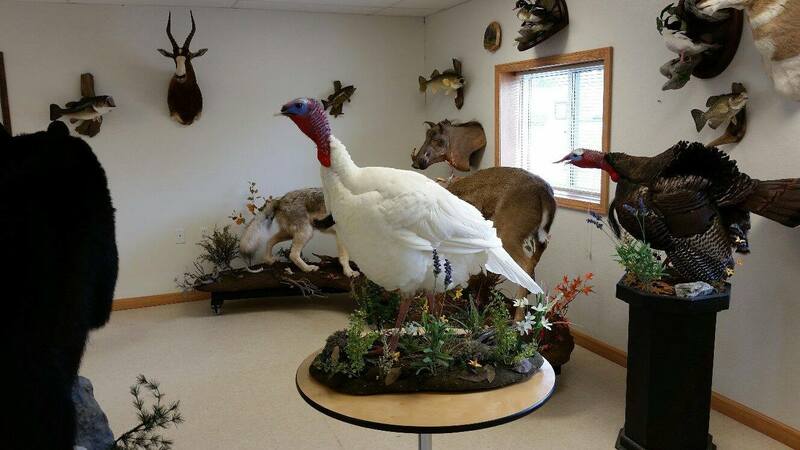 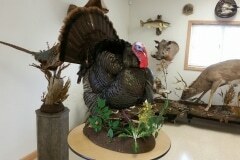 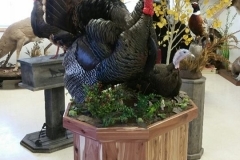 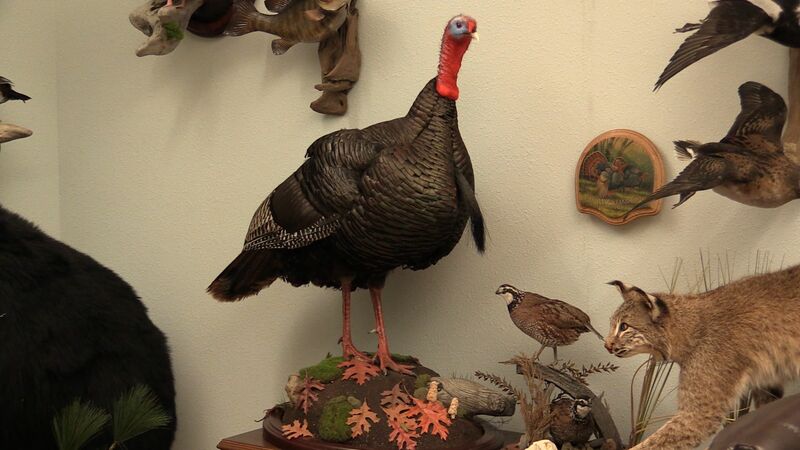 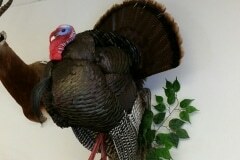 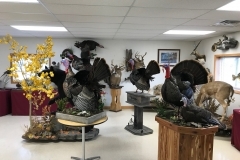 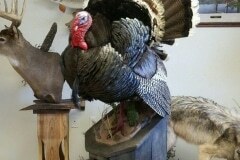 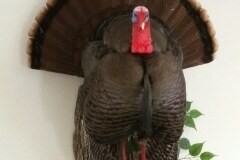 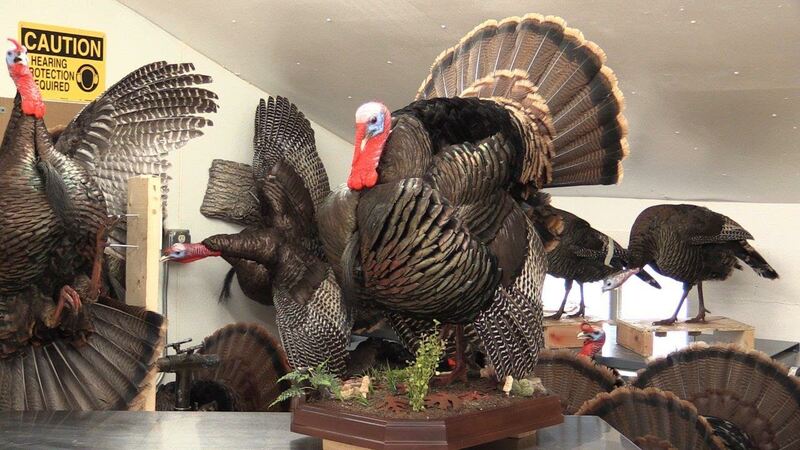 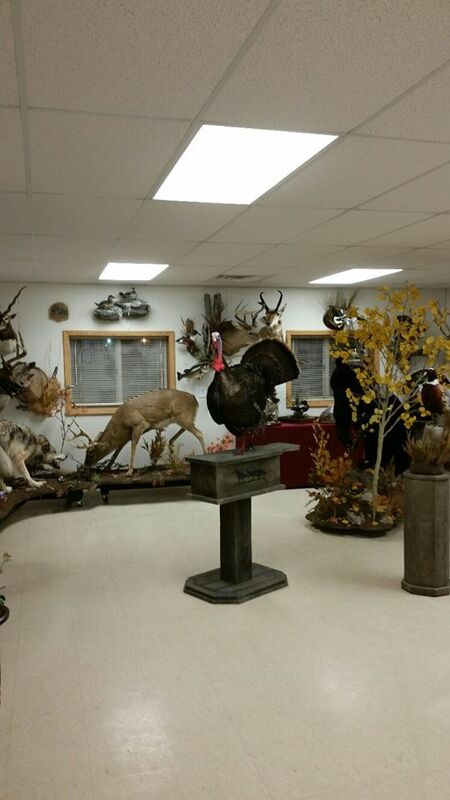 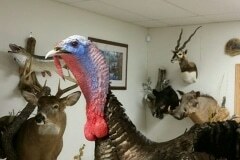 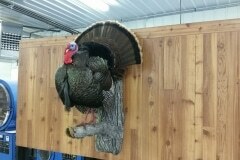 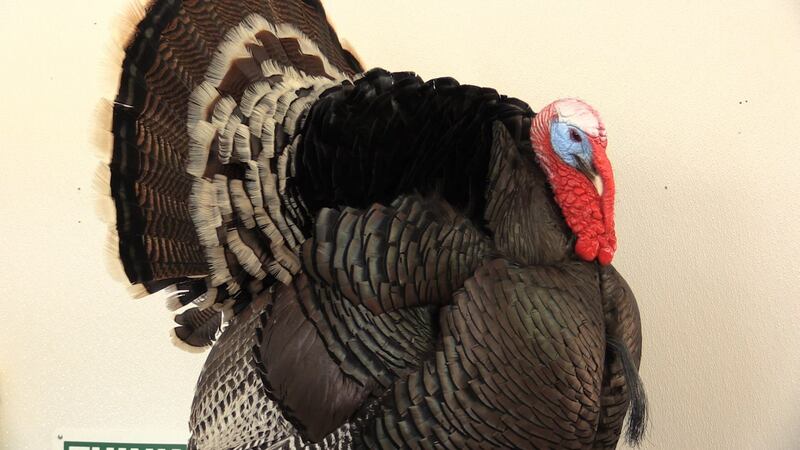 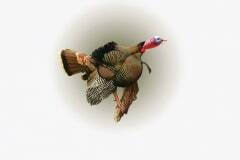 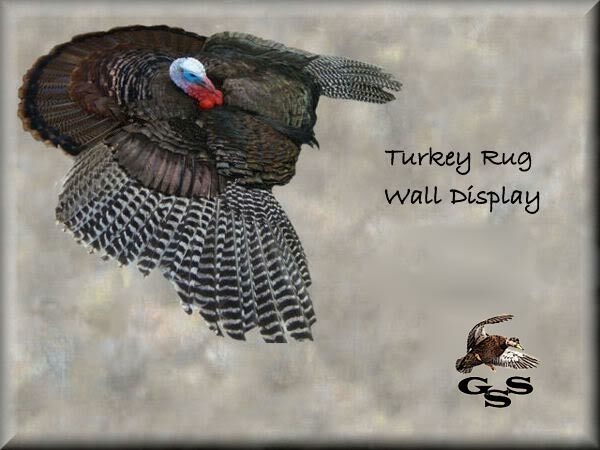 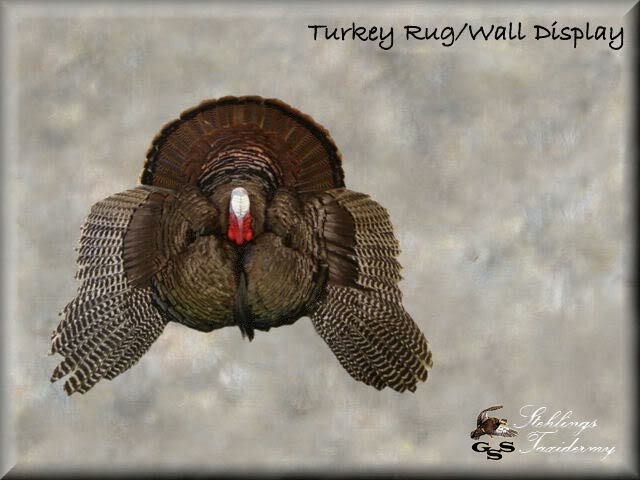 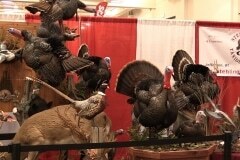 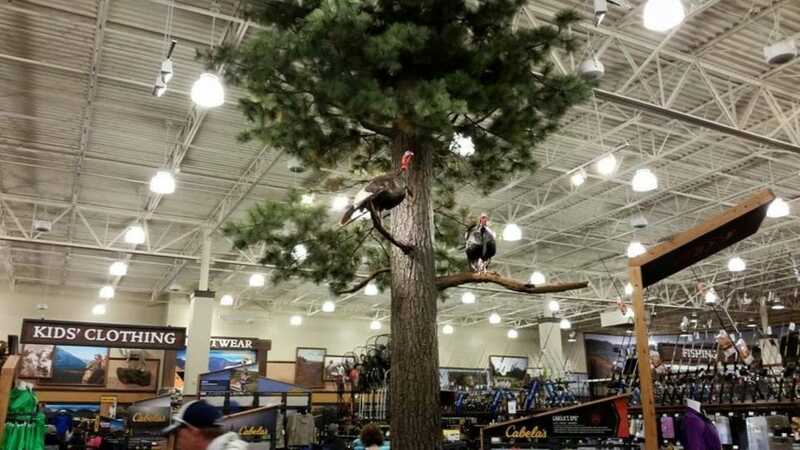 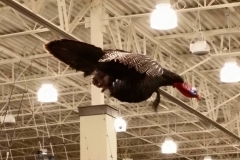 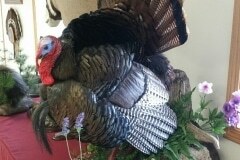 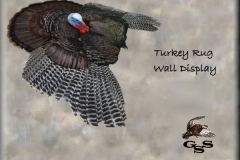 You are welcome to stop in and experience our 1000 sq foot showroom full of turkey mounts . 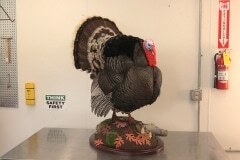 In addition to mounting turkeys, we also have our own freeze dryers and freeze dry all of our own turkey heads. 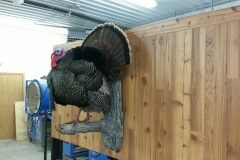 All heads are freeze dried at our studio in our commercial freeze dryer. 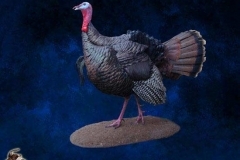 Freeze dried heads offer excellent detail and you get your original head . 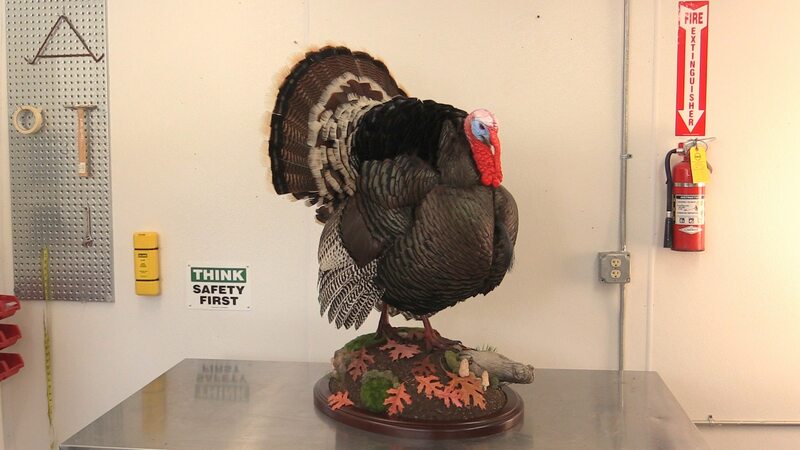 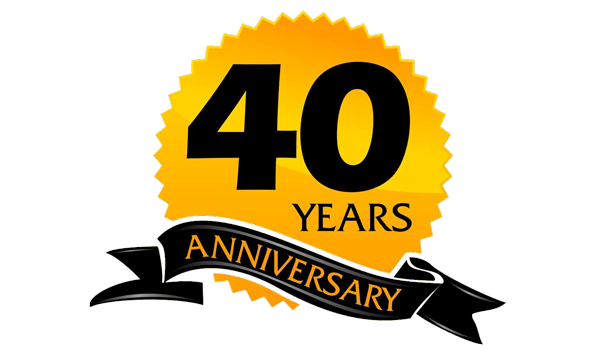 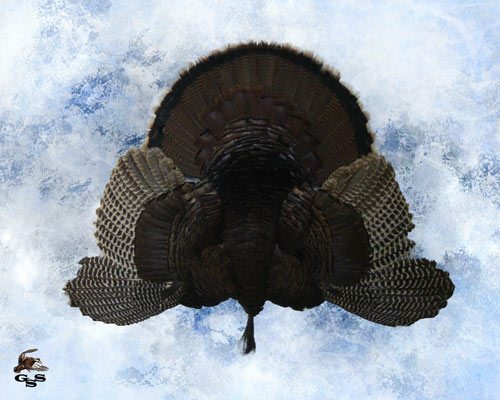 We have mounted thousands of turkeys over the last 40 years . 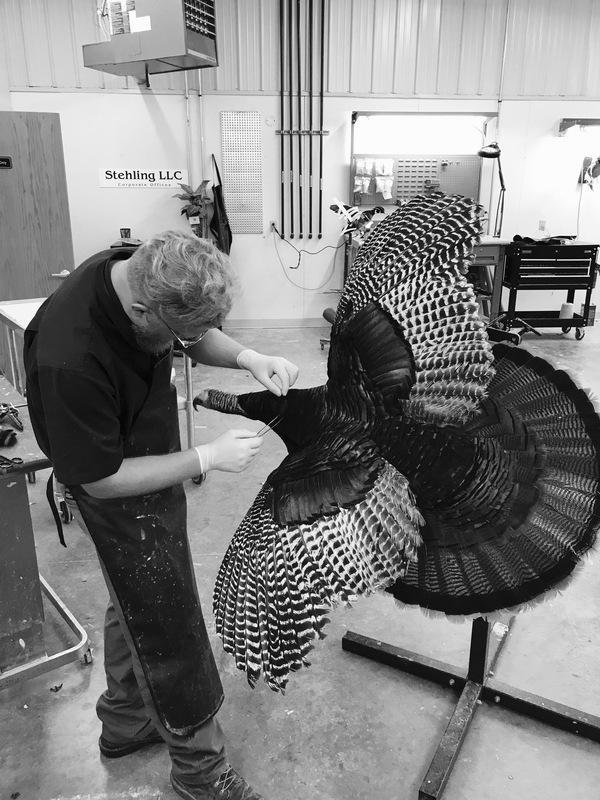 We groom every feather, hand paint the head and legs, and pay close attention to live reference birds to give you back an accurate mount. 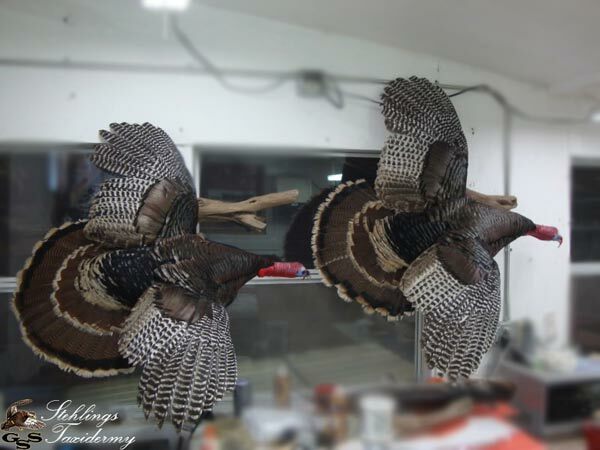 Every step of the process is done right . 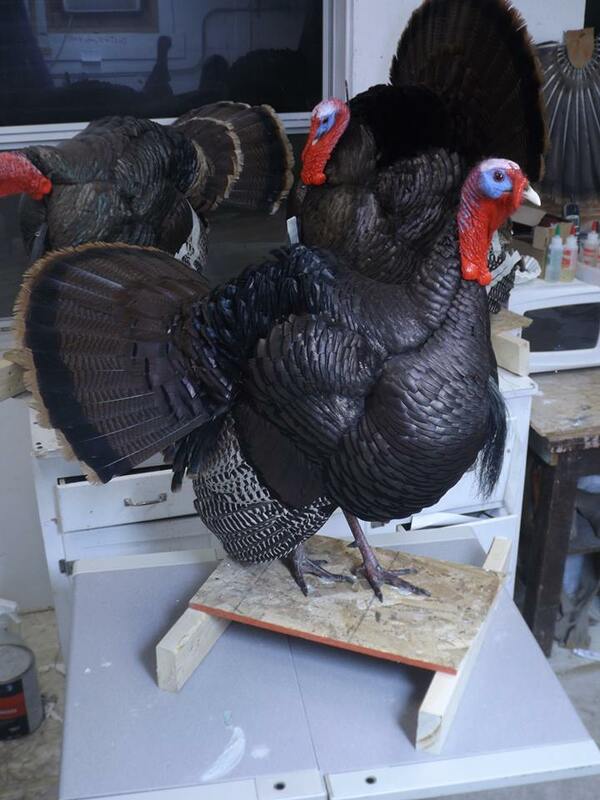 From fleshing/washing steps to the final airbrush painting, no shortcuts are ever taken on your mount . 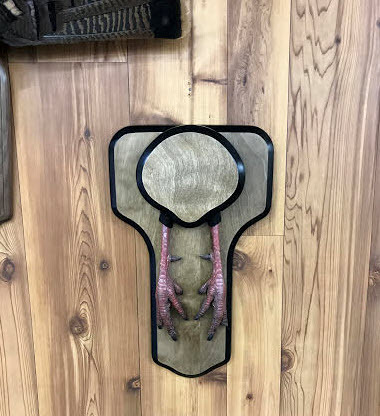 This means you get back a quality piece that will stand the test of time. 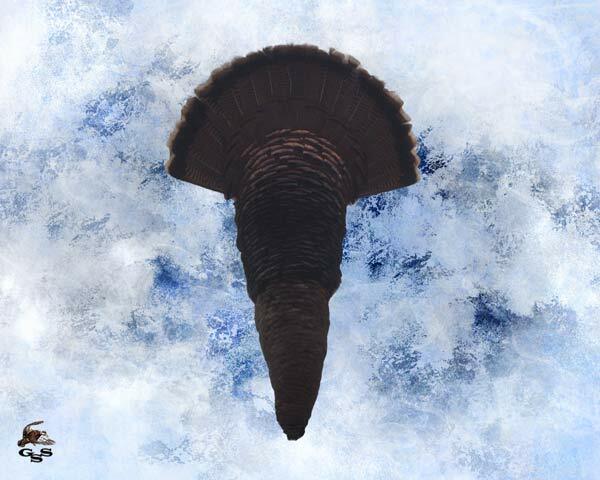 If you can dream it, we can recreate it . 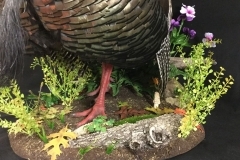 From custom Spring scene bases to limb mounts and everything in between, we have done it . 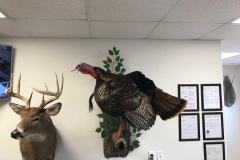 We work with you to get exactly the mount you are looking for and keep you updated along the way .We do everything we can to make the taxidermy process as enjoyable as the hunt . 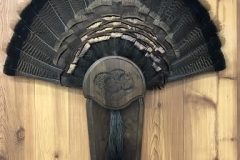 We want to work with you before you go on your next or first turkey hunting adventure. Whether you are going to Nebraska after Merriam’s, Florida for Osceola’s , or staying close to home after Eastern’s, we want to advise you on how to take care of your trophy. 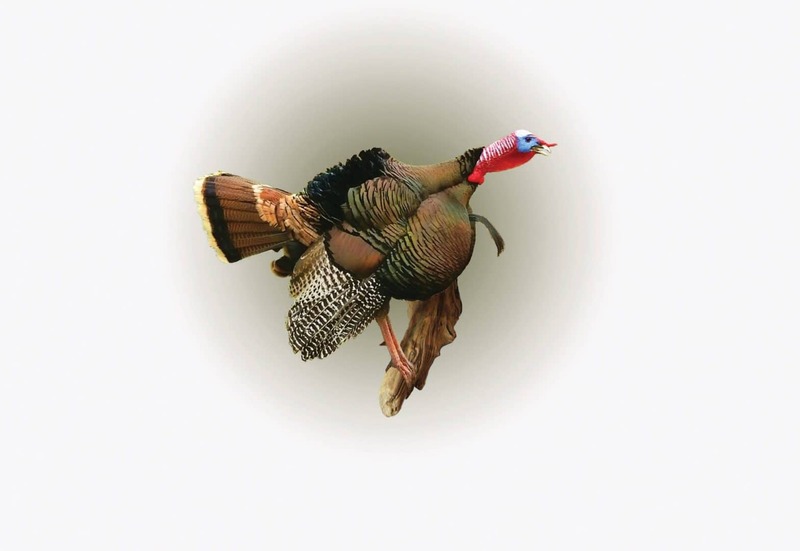 There is no better way to do that than to contact us before you go on your trip. 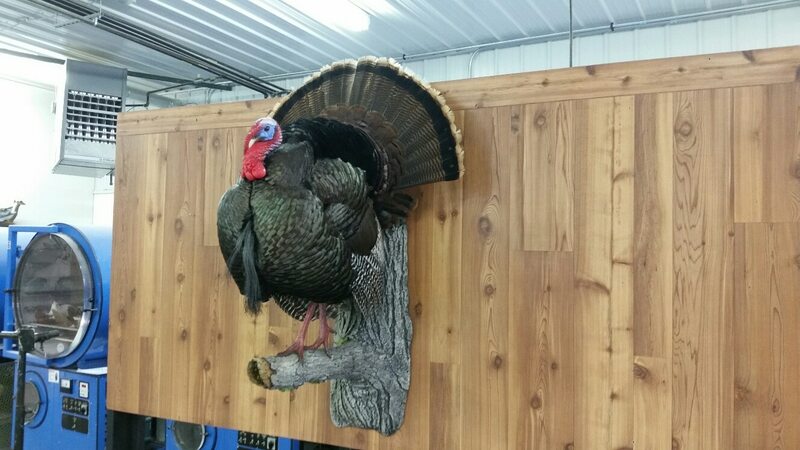 Contact us or stop by to discuss your next mount.